We've cruised on the Carnival Spirit four different times. 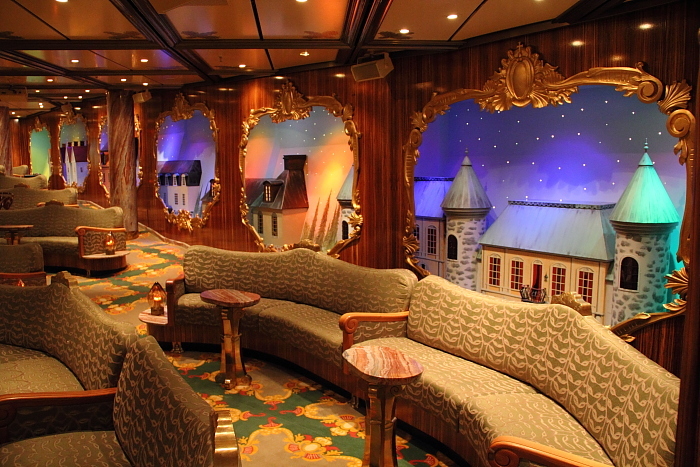 Here's a look at what makes this cruise ship so special! 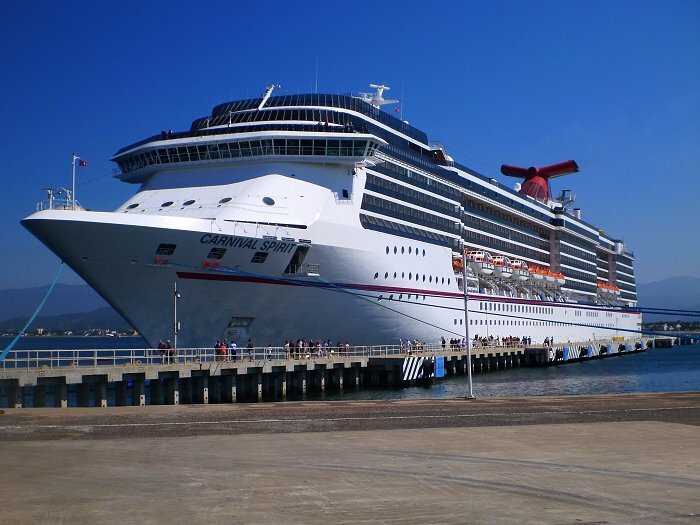 My wife and I have cruised on the Carnival Spirit four different times now... most recently in March of 2012 for a 9-day cruise to Manzanillo, Puerto Vallarta, Cabo San Lucas, and Ensenada. That was our 13th cruise with Carnival! As you can probably tell by the way we keep coming back for more, we really love Carnival cruises and we especially love the Carnival Spirit! 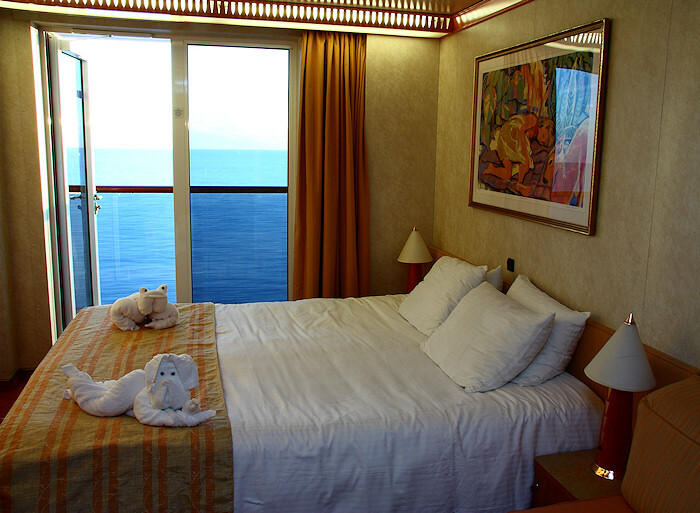 The Carnival Spirit was in dry dock in January of 2012 to get some improvements... such as flat screen TVs in all the rooms, a hugely-improved water slide, and an adults-only Serenity Retreat. I was really curious to see the changes for myself, after getting to know the Carnival Spirit pretty well on those three previous cruises. This Fall, Carnival is taking her off of the California-to-Mexico run and moving her to Australia... so I thought I would try to document all the things I like about cruising on the Carnival Spirit in case there are any curious Australians searching the Internet for information about her. I'll be sharing with you a lot of pictures that I've taken of the Carnival Spirit over the years. Every picture on this page is my original photo... none are stock images or supplied by Carnival. Most of the photos were taken with my Canon Digital Rebel T2i camera. Let's get started by telling you about the renovations that were done to the ship while she was in drydock in January of 2012. The biggest changes were done up on the top decks. 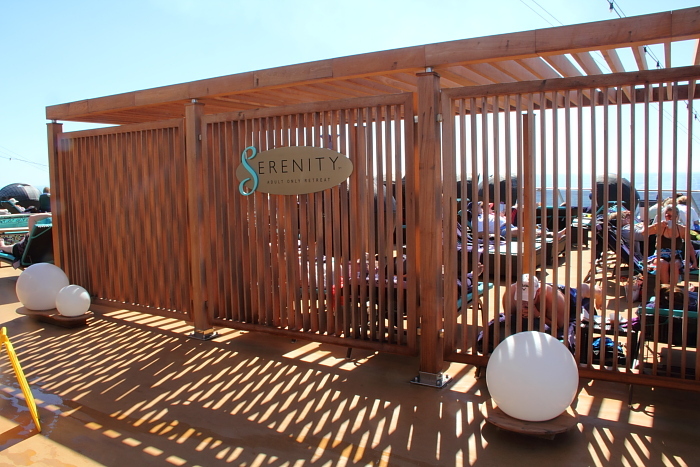 On the Lido deck, at the aft (rear) end of the ship, a new Serenity Retreat was added. 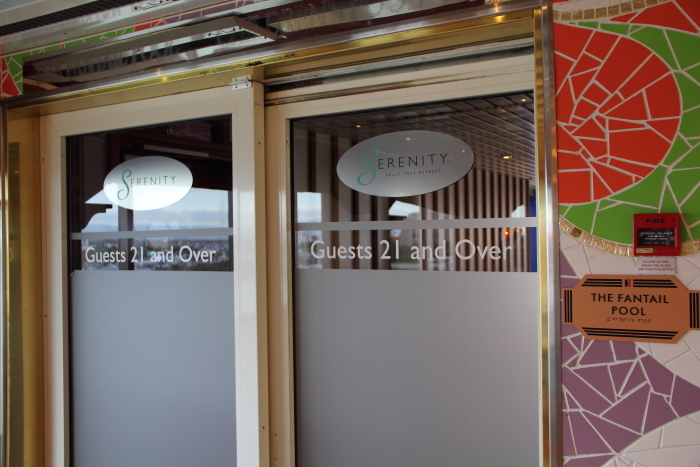 All of Carnival's newest ships from the last few years have had these Serenity Retreats, but Carnival hadn't come up with that feature yet when the Carnival Spirit was a brand new ship back in 2001. Now, she finally has one. What's so special about the Serenity Retreat? First off... thick, comfortable cushions on all the loungers. Plus, there are several very large loungers that can fit a snuggling couple... and that have a shell which provides shade. Also, the entire Serenity area is adults-only... so, there's no pesky kids to ruin the serenity of it all. There's also a jacuzzi and a small swimming pool... and again you will only find adults in them... no kids. 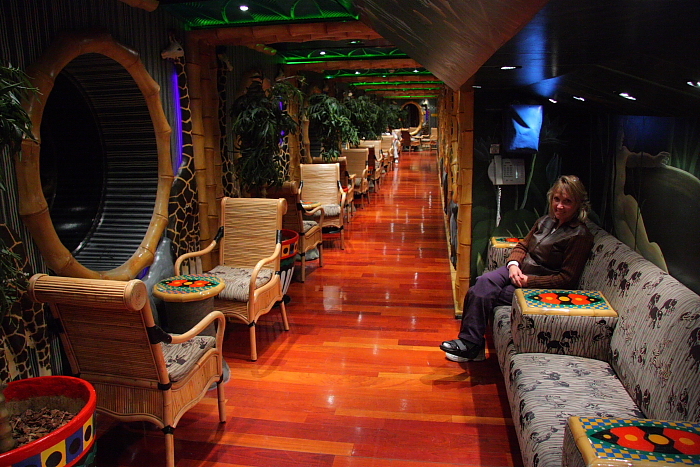 The only problem with the Serenity Retreat on the Carnival Spirit: it's too small. EVERYBODY wants to hang out here, so it fills up really fast in the morning and it's tough to find an empty spot during the day. I think that Carnival was kind of stingy when they bought the new TVs and opted for a somewhat small TV to save on costs. There's room up there on that shelf for a much larger TV, and because it's typically viewed from the bed on the other side of the cabin... this TV seemed a little too small. They did spend a whole bunch of money on brand new exercise equipment for the gymnasium. They had some really impressive looking treadmills, exercise bikes, and weightlifting equipment. It's not my thing, so I didn't take a picture of it. This video has "gone viral" on YouTube! It has been viewed over 90,000,000 times! The Green Thunder slide is awesome... I went down it two times! I would have done it more often, but the weather during our cruise was just a little bit on the cool side. The first time I rode it, I was really intimidated by it... because the thought of the floor dropping out from under me at the beginning of the ride just scared the heck out of me. Plus, on a similar waterslide in a waterpark near our home, I got scraped up going down the slide. So, I was worried that the Green Thunder might be both too scary and a bit painful. Well, it was scary, for sure... but not at all painful. There was no scraping at all as I shot down the slide. It was an adrenaline rush, though! In retrospect, I regret not going down the Green Thunder slide more than two times during the cruise. It was one of the highlights! 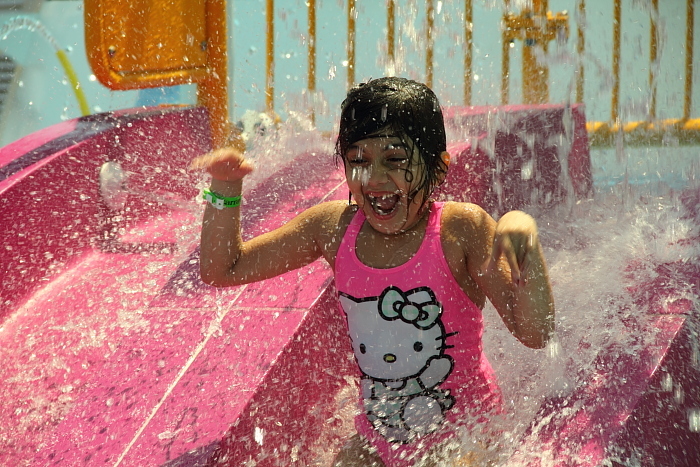 A funny thing happened as I was shooting photos of all the little kids having fun in the WaterWorks area. Some kids are very easy to get good photos of, because they have a very expressive face that shows off how much fun they are having. The little girl in that cute slide photo was one such photogenic kid. So, after a while I started ignoring all the other kids and just pointing my camera at this little girl. Her parents were right there and it was obvious that I was shooting photos of their daughter. I wondered if they might think I was some kind of creepy old guy who got his kicks out of taking photos of girls in swim suits. After a few minutes, the father walked over to talk to me... and I thought "oh, no, he's mad and he's going to ask me what the heck I'm doing taking photos of his kid." Imagine my surprise when the guy came over and introduced himself and said that he recognized me because he had seen my web page about the Carnival Spirit! He said that in his pre-cruise research he had Googled "Carnival Spirit" and found my page. He introduced me to his wife like I was some kind of celebrity! It was funny, and the truth is that this was actually the second time that someone on the ship had recognized me from seeing the pictures I had posted on this page. It has happened to me on the Carnival Spirit before this, too. 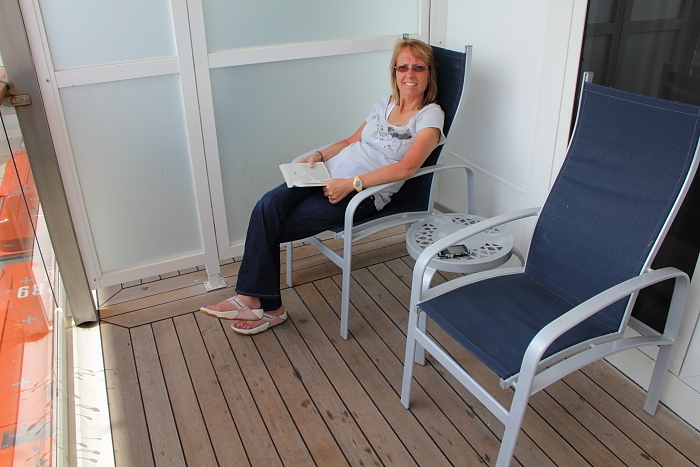 It always surprises me to meet someone that has actually read one of my cruise reviews. Back in the days when the Carnival Spirit was brand new, they designated the pool in the far back end of the ship as the children's pool. But at some point, they decided this was a bad idea and they went the complete opposite way and designated the aft pool as "adults only". I think they realized that it made no sense to have a children's pool located next to the Fantail bar... you probably don't sell a lot of cocktails next to the children's pool! 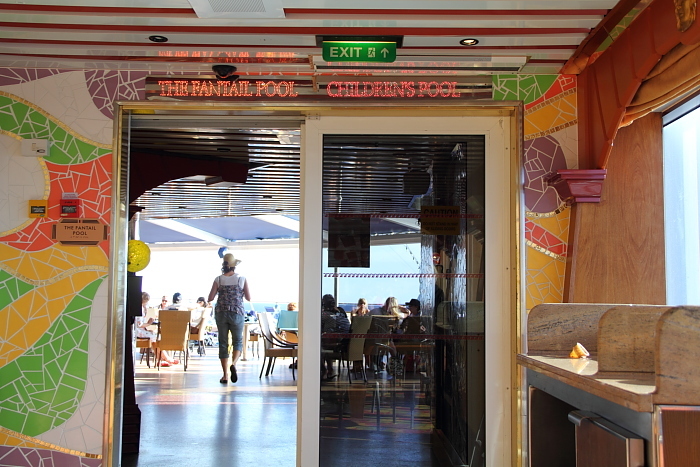 I always thought it was funny that years after they designated the aft pool adults-only there were electronic signs above the doorways indicating that this was the way to the childrens pool. Hurray to whoever finally noticed it and had these electronic signs shut off! The signs are still there, but you can barely notice them anymore because they are no longer lit up. Another thing I hadn't heard anything about was that part of the new Serenity Retreat features tables and chairs where you can bring food from the Lido buffet and have a nice quiet lunch. It's in the shady area near where the old fantail bar used to be. Unfortunately, I did not get a picture of it. Also, there is still a bar where the old fantail bar used to be... I just don't think they call it the fantail bar anymore. It's probably the Serenity bar, or something like that. Sometimes having a bar in the Serenity area is not a good thing... as the serenity can be shattered by loud drunk people... but on the other hand it is nice to be able to get a cool drink back there. One thing I noticed they didn't do anymore back there at the tail end of the Carnival Spirit was to offer the "make-your-own ice cream sundae" bar. In my previous cruises on the Spirit, they had these several times during each cruise... but no more. The area where they used to have these is now part of the Serenity area, so I suspect the ice cream sundae bar went away at the time Serenity went in. There was one day on our 2012 cruise (the day they had the chocolate buffet at lunch) where they were serving real scoops of ice cream in the desert area of the buffet... but without all the topping choices that they used to have in the old days. Here's an old photo of the "make your own ice cream sundae" bar that they used to have on the Carnival Spirit. The guys behind the counter would scoop the ice cream for you, and then you could add on any of the toppings at the counter. A very positive change that I was happy to see was that prices for Internet access are now lower than they used to be. That was a really nice surprise to discover. I bought 255 minutes of Internet time for my 9-day cruise, and that set me back $92.95 Also, FINALLY, you can read John Heald's blog for free with no Internet charges. He's been saying for years that it was supposed to be that way... this is the first of our 13 Carnival cruises where that actually was true. 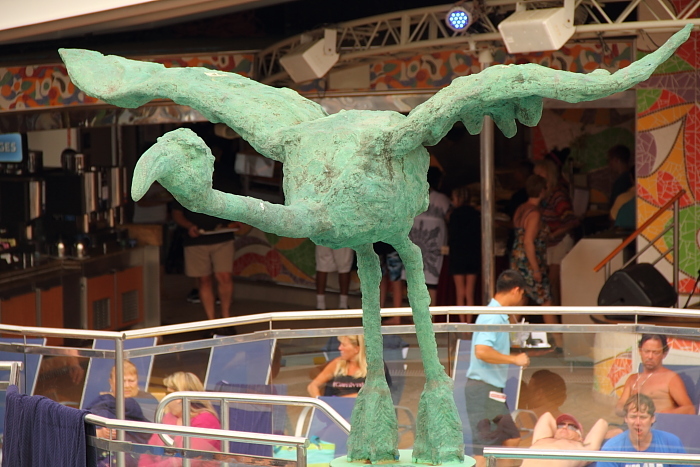 One thing I wish they had done during the recent refurbishment would be to get rid of those ugly bird sculptures up on Lido deck! I'm sure that Joe Farcus, the interior designer of the Carnival Spirit, thought the sculptures (there are THREE of them!) were whimsical and fun when he came up with the idea. I think they're a bit creepy! When I see them, two thoughts come to mind... vultures picking at the carcasses of passengers as they suntan on deck, and giant sea gulls pooping in the jacuzzis. It would have been great if Carnival had removed these during the refurbishment... but they didn't! 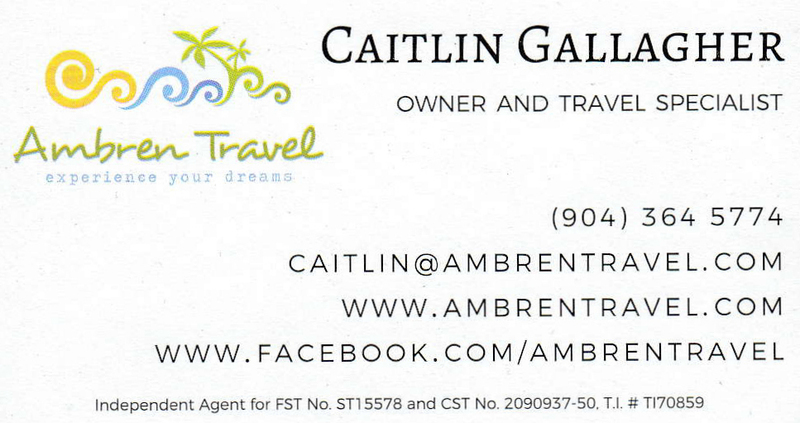 So, get used to them... just like the pink circles on the Carnival Splendor. I do have to stress that overall we did have a nice time on our 9 day cruise. 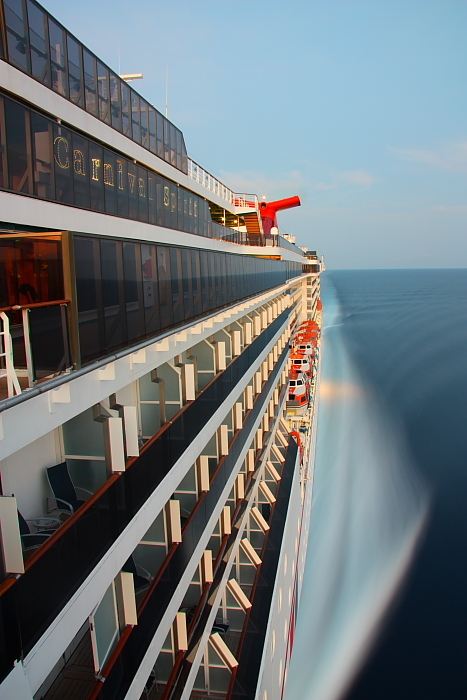 Just because I point out a weird thing or two, don't get me wrong... a cruise on the Carnival Spirit is a great vacation! The extra space in an extended balcony cabin is really nice. It only amounts to about an extra 1.5 feet added to the depth (not width) of the balcony, but that does make it feel less cramped than a regular balcony cabin. In the photo above, if this had been a regular balcony cabin... my wife's toes would have been right up against the glass. We had always thought it would be best to go with a regular balcony because they look straight down on the water, rather than straight down to the lifeboats like the extended balcony cabins do. But this didn't turn out to be much of a factor. I think in the future I'll be quite likely to book an extended balcony again. As you can probably figure out from the fact that this was our 13th Carnival cruise... my wife and I just really enjoy cruising with Carnival and we find it an exceptional vacation value. 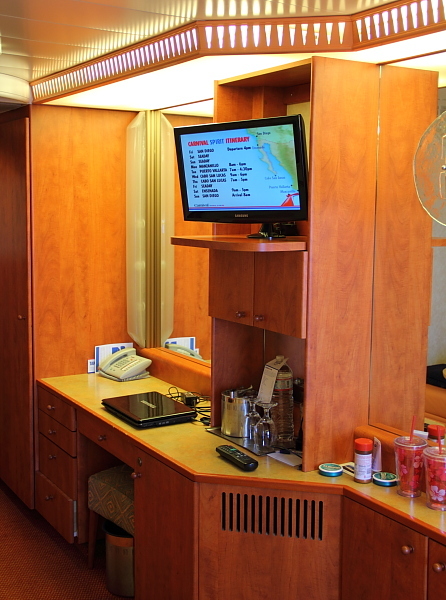 We like the entertainment, the food, the atmosphere, the size of the cabins and all the storage space, the awesome luxury of having a room steward cleaning up after us, and all the fun things we get to do at all the ports of call. There are lots of little things that Carnival does that I have learned to appreciate, too... especially after I did a little experiment and took one cruise (a few years ago) with Norwegian Cruise Lines to see if there was any advantage of one cruise line over the other. It really helped me to see the little things that Carnival does to improve my cruise experience. 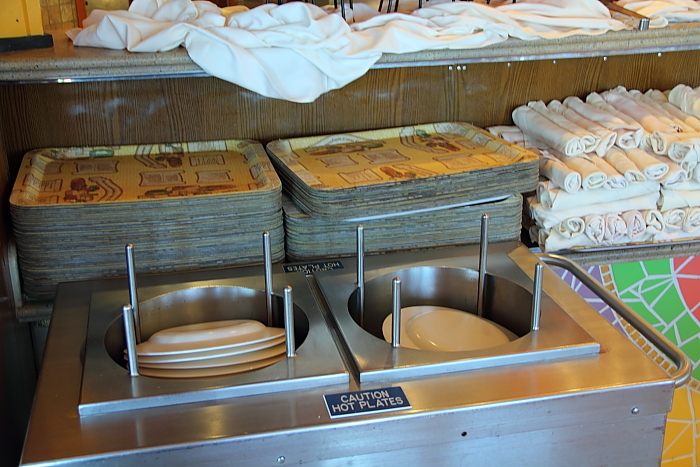 For example, have you ever paid any attention to that big silver cart that they use in the Lido buffet restaurant to store the plates? Ever notice that it has a power cord plugged in to the wall? That's because the big silver plate storage thingie is actually a plate heater... so that your plate is nice and warm when you start piling food on it in the buffet. This helps keep your food from getting cold before you get to your table, because the warm plate helps keep the food warm. It's a neat little thing that Carnival does! The silver contraption holding the plates is heated, and ensures that your plate does not make your food cold. This is one of the little thoughtful things that set a Carnival cruise apart from some of the others. Ever notice that Carnival toasts the bun of a hamburger before they serve it to you? Norwegian Cruise Line just served cold hamburger buns when I cruised with them. And in the main restaurant on Norwegian when they serve you a dinner roll, it is not a heated roll... and furthermore it is served with chilled butter... which makes it impossible to spread the butter on the roll. In Carnival's main dining room, dinner rolls are served heated... and the butter is at room temperature, so it spreads easily on your roll. Little things make all the difference! I'd like to mention two crew members that I was really impressed with. One was Abigail, our cabin steward. Out of all the cabin stewards we've had over 13 Carnival cruises, I think she was probably the best! She was extremely friendly, and spoke English extremely well. Sometimes you get a cabin steward with a really thick accent or bad English skills, and it makes communicating with them very difficult. Abigail had no problem there... did her job well... and seemed happy and friendly. Everything you want in a cabin steward. The other crew member that really impressed me was the keyboard player and lead vocalist in the band "Hi-Lux". Her name is Maria. She was amazing! Not just a good singer and musician, but what really impressed me was the ATTITUDE on stage... smiling ALL the time... and just generally looking like she was having fun and enjoying entertaining the crowd. HiLux is a 4-member cover band from the Phillipines with a nice sound. We enjoyed them most when they played in Club Cool... because the acoustics in there are really good. 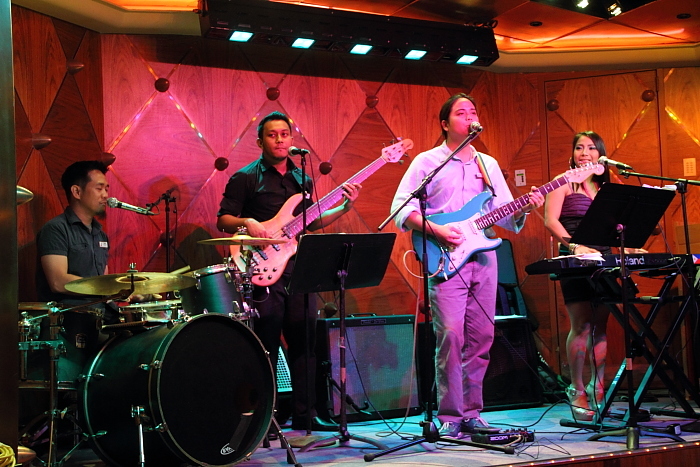 They also played at the Mega Deck Party on Lido deck... which was fun, but the acoustics out there are kind of lousy. It was obvious that the Cruise Director acknowledges that the HiLux band is the best musical act on the ship... as he had them do the music for the past guest party. At every other past guest party I've ever been to, the ship's show band has played. But Hi-Lux was great, and I can see why the CD had them play rather than the show band at the big past guest party. Sometimes on a cruise you see a musical act that just seems to have it on auto-pilot. They've done the same shows over and over week after week for months and the passengers all look the same and all they want to do is get through one more show so they can go to the crew bar and party. Know what I mean? Hi-Lux, and especially Maria, their lead singer, did not have this problem. In fact, I made a little bet with my wife that it must be the first week or two of their contract on the Carnival Spirit because their attitude seemed so good... not burned out yet, because they just got here recently. So, during one of their breaks, I went over and chatted with the guitar player... and asked him how long they had been on the Carnival Spirit. I was surprised to hear that they had been onboard for two months! I lost the bet, for sure. I told him how impressed I was with their good attitudes, and especially at all the energy coming from Maria. He said she was like the Energizer Bunny with all her energy, and that she keeps them all going. Speaking of colorful characters working on the Carnival Spirit... 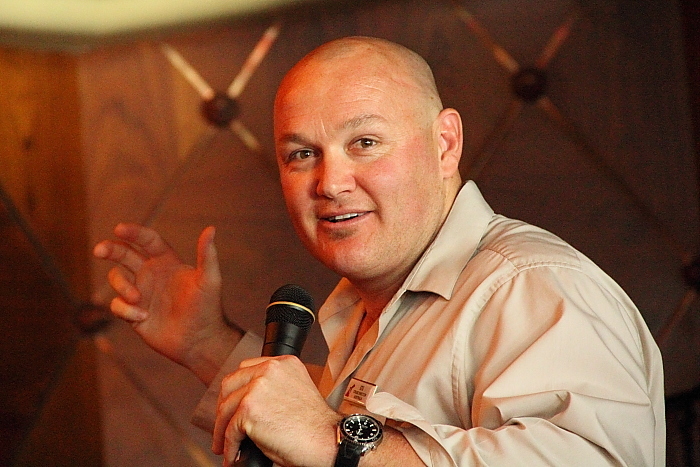 I have to tell you about something funny that my wife and I laughed about a LOT... and it involves the Cruise Director of the Carnival Spirit, Stuart Dunn. We've cruised with Stuart before... so we knew that he is from Australia. Before our cruise, I thought it would be fun to do something nice for Stuart just to let him know that someone was thinking of him and hopefully to put a smile on his face and have a few laughs with him. So, I went on eBay and found a little ski-cap in the shape of a Koala bear. Stuart is completely bald, so I thought it might be a cute visual gag for him to have this little Koala bear hat for his head. In my fantasy, I thought he might get such a kick out of the gift that he might take it with him on stage one night and have some fun with it in front of the crowd. Well, it didn't quite work out that way! I decided to give it to him after he finished with the "Fun Ashore" talk in the main theatre on the second day of the cruise. My wife and I waited until after his presentation was completely over, and just lurked around the theatre entrance as the crowd was leaving... hoping that we might catch Stuart on his way out. As luck would have it, we did. So, there we were, just outside the theatre and I got Stuart's attention as he was walking out. I told him I had a little gift for him. I had it in a bag so that he couldn't see it until I had a chance to kind of set up the gift with a story. I explained that we had cruised with him before and that I knew he was from Australia and that I was sure he missed home a lot. I also told him that I knew that the first night or two of a Mexican Riviera cruise can be a little chilly, and that since he is bald that he might need a little something to keep his head warm on those chilly nights. And then I pulled the hat out of the bag and showed him that it was in the shape of a little Koala bear... and I waited for his reaction. Oh my gosh, I wish I had a video camera, because it was hilarious. The hilarious part wasn't that he said anything charming to thank us for the gift, or that he was overflowing with appreciation for someone thinking of him... the hilarious part was how much HE HATED IT, and couldn't hide it!!! I hope this guy doesn't play much poker, because he's got no poker face, that's for sure. Yeah, he simply hated it. He said something about putting it with his other Australia memorabilia... but it was clear to me that he was never gonna wear it and I didn't dare ask him to model it so I could get a photo! My wife and I laughed about how much he hated it for quite a long time after that! Even though I didn't get his reaction on video, I did have a witness! At the moment when Stuart came walking out of the theatre, we happened to be in the middle of a conversation with the Future Cruise Consultant. So, she was standing right there with us for the entire conversation with Stuart. I was glad that someone besides just my wife and I got to see the look on Stuart's face. The next day, we went back and talked to the Future Cruise Consultant again and had a good laugh with her about how badly my gift for Stuart had bombed! A beautiful sunset during our March 2012 cruise on the Carnival Spirit cruise ship. Let's get to the question of whether or not I would recommend this cruise to others. Even after 13 cruises with Carnival, I do still love it! But I have to be honest and say that I think a Caribbean cruise is quite superior to a Mexican Riviera cruise. If you live within driving distance of one of the west coast ports, a Mexican Riviera cruise makes sense... because you can drive to the port, and that keeps your overall vacation cost down. But if you live somewhere far away from California, I don't think it makes any sense to fly out here for a Mexican Riviera cruise. You'd be better off to fly to Florida and cruise the Caribbean. Any Caribbean cruise is better than the best Mexican Riviera cruise. But if you're within driving distance of the port, it's a good value. One of the problems with a Mexican Riviera cruise is the weather during the first day or two and the last day or two. As I mentioned, this was my fourth time on the Carnival Spirit, and not a single one of them ever had good weather on the first or last day. And this particular cruise had pretty ugly weather for the first day and a half, and the last two days. When I say ugly weather, I'm talking about totally grey sky with no sun, and enough wind to keep you from wanting to spend much time out on deck. You certainly can't blame Carnival for this... it's just a typical weather pattern on the west coast. Cruise the Caribbean, and you tend to have a much larger percentage of good-weather-days. Another advantage of a Caribbean cruise is warmer ocean water temperatures and better visibility underwater... which makes for better snorkeling. 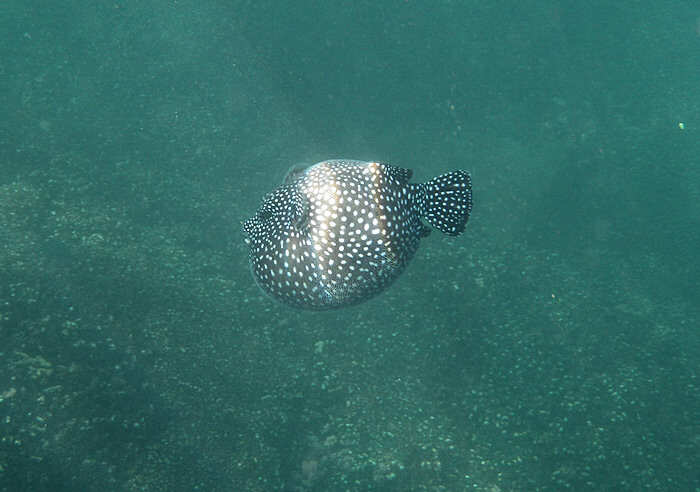 We did a snorkeling shore excursion in Manzanillo, and I could barely see my feet... the water visibility was so poor. Snorkeling in the Caribbean is simply superior. Don't get me wrong... this was a good cruise and we got a lot of bang out of our vacation bucks spent. I enjoyed the new Green thunder waterslide they added during the recent refurbishment. The entertainment was really good: the music, the four different stand-up comedians, a comedy-juggling show, a comedy-hypnotist show, several Broadway-style shows, and several musical acts including that great cover band, Hi-Lux. The food was good... better than what I get in my normal life at home. I simply like cruising... visiting several different destinations over the course of the vacation, rather than being stuck at one the whole time... but only having to unpack once. even though they were holding the "mixology" competition out on this deck. Another example of this was during the "mega deck party" at 10 o'clock at night with 20 knot winds blowing over the ship. It would have been so nice out there if the dome had been closed, but it was wide open. And this is not the first time this has happened. In my previous three cruises on the Carnival Spirit, I have never once seen the dome slid closed over the lido pool, even during bad weather. What's the point of having a sliding dome over the lido deck if you don't use it? It would have been SO MUCH NICER if that dome had been closed during the overcast/rainy/windy days. I did a previous Mexican Riviera cruise on the Carnival Splendor when it poured rain one day... and it was so great out by the Lido pool withe the dome closed! But no such luck on the Spirit... they never closed it for any of the bad weather on this cruise. If I were in charge, the policy would be that if it's under 80 degrees outside, the dome stays closed. If someone doesn't like it, they can go out to the second Lido pool, which does not have a dome over it... or go up to deck 10 where there are plenty of loungers in the open air. I've actually talked to the staff about this on two different cruises and what they tell me is that they are only allowed to open or close the dome when the ship is not in motion. So, basically, a decision about what position to keep the sliding dome in must be made before the ship gets under way. If they run in to bad weather while en route, they can't close the dome because the ship is moving. So, it comes down to anticipating bad weather before the ship encounters it. Whoever's in charge of deciding the position of the sliding dome just isn't bothering to look at the weather forecasts and use a little thought about what kind of weather we're likely to encounter between then and when the ship will be stopped again. OK, that's my only significant gripe about the cruise. Other than that, it was a nice vacation! 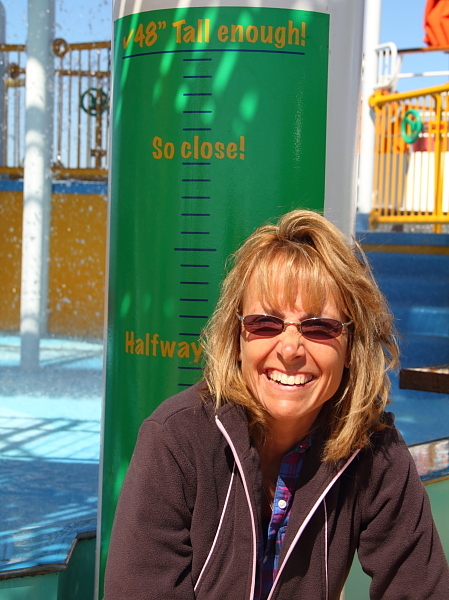 Here's a fun photo from Cabo San Lucas. 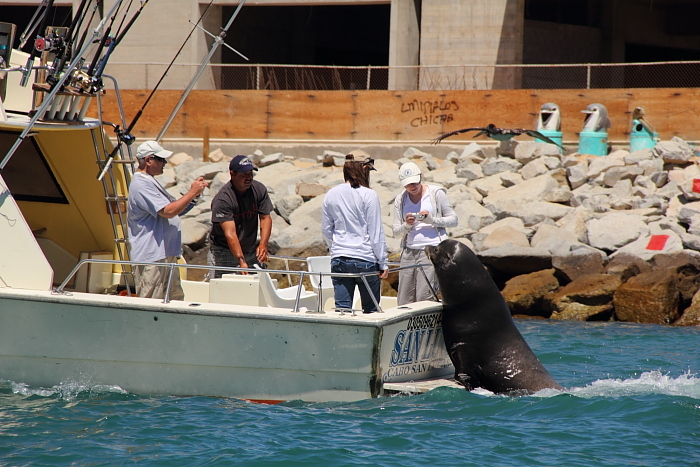 Check out the Sea Lion begging for fish at the back end of this fishing boat as it returned to the marina. The sea lions are really smart! They only do this to fishing boats returning to the marina. They don't do it to any other type of boats... such as water taxis or ship tenders. They can tell the fishing boats from the other boats. They also don't do it to boats leaving the marina... only to boats returning. Boarding a cruise ship in San Diego can be a little hectic and frustrating. The facilities in San Diego are not the best for handling large crowds. Boarding at the Carnival facility in Long Beach is a lot better, and the best I've ever experienced was boarding at the Carnival facility in Miami. I don't worry too much about boarding, though, because I've cruised with Carnival more than 10 times and therefore I get some special perks for being a "platinum" level guest. One of them is "priority embarkation". Simply put, that means that I get to jump ahead through most of the lines during the embarkation process... and I get to be one of the first on to the ship. This probably saved me about an hour in San Diego. Not only do you miss all the frustration of sitting around and waiting for an hour, but you also get up to the Lido buffet before it gets crowded. I've done ten ship embarkations as a regular guest and three as a platinum (V.I.P.) guest, and I can tell you without a doubt it's better to be a V.I.P.! There is one trick you can use if you've cruised less than ten times but would like to have priority embarkation... you can book a suite. 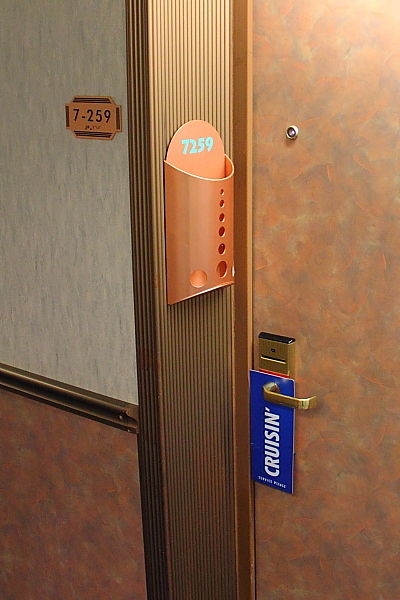 Guests who are staying in a suite get priority embarkation, even if they're not officially platinum level guests. the "Fun Times" (daily newsletters) for the entire cruise, the list of shore excursions (and prices), debarkation information, and list of benefits for platinum-level (10 or more) cruisers. One thing to point out about the list of platinum perks... the list omits the best perk of all: priority boarding on embarkation day. The reason this is not on the list is that the intention is that the list would be read AFTER boarding, so there was no sense in listing a boarding perk. All the information on this page, so far, was written after our March 2012 cruise on the Carnival Spirit... which was our fourth cruise on this ship! 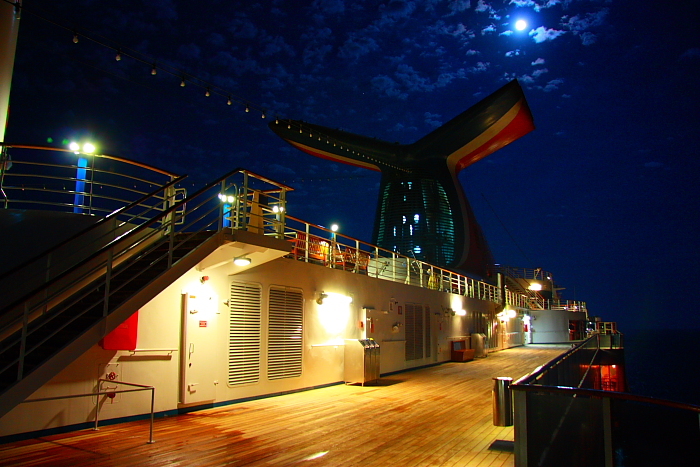 The following information was written about our previous three cruises on the Carnival Spirit. Our first cruise on the Carnival Spirit was in January of 2009 for an 8-day "Mexican Riviera" cruise to Acapulco, Zihuatanejo, and Manzanillo, on the Pacific coast of Mexico. It was such a great experience that we decided to do the exact same cruise again in November of 2010. 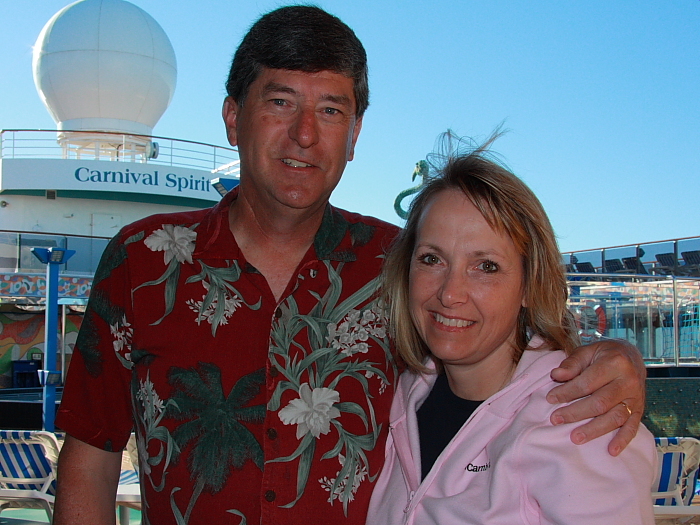 A couple of months later, we were back for more... a 5-day cruise to Cabo San Lucas, in January of 2011. 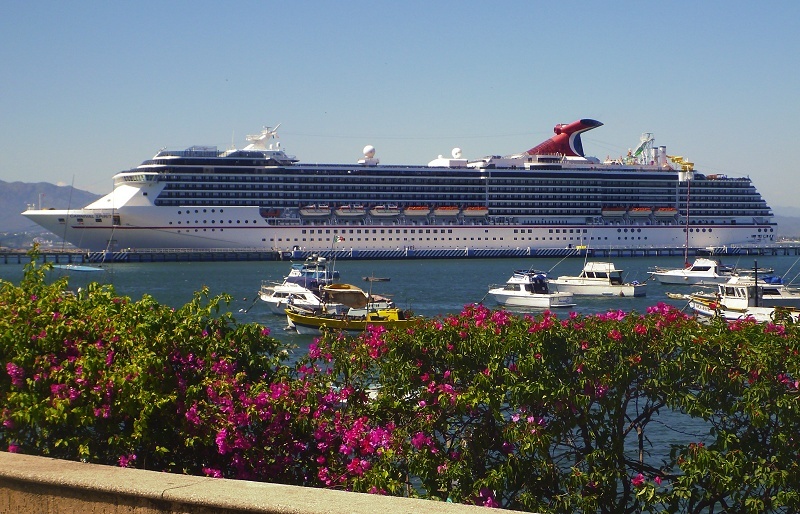 All of our cruises on the Carnival Spirit sailed out of San Diego, California. 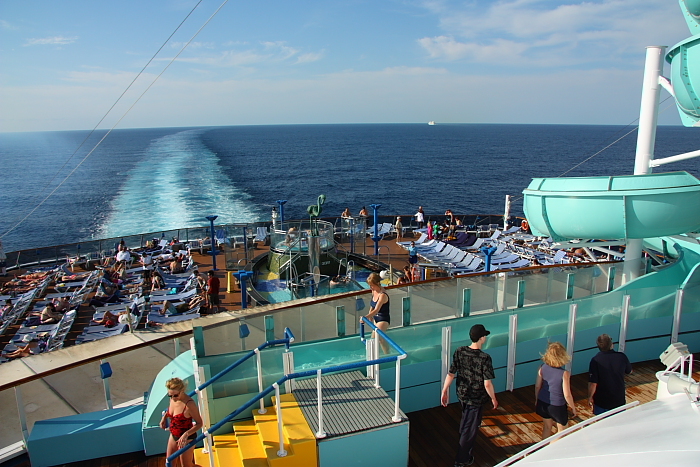 On a "fun day at sea", the Lido deck is definitely the place to be! Here's a very unique view of the Carnival Spirit at anchor off of Cabo San Lucas. I took this while parasailing! 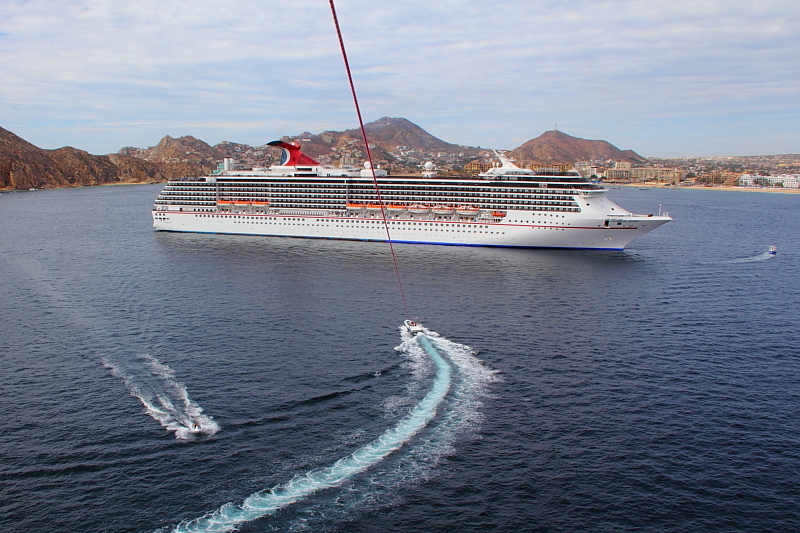 Notice the red rope connecting the parasailing apparatus to the tow boat. Towards the end of the cruise, you can see we had more color in our faces! 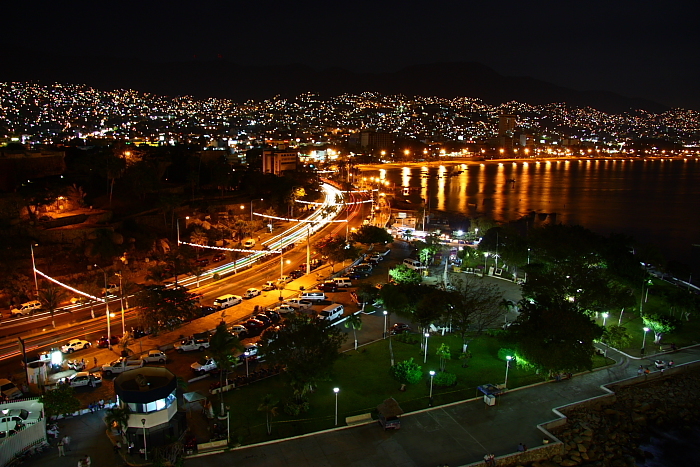 You can see the lights of Acapulco in the background. Sadly, cruise ships don't visit Acapulco anymore... due to the violence among the drug gangs. Acapulco Bay is incredibly beautiful, and I'm so glad I got to cruise there twice! Of all the pictures that I've taken of the Carnival Spirit, this is certainly one of my favorites. 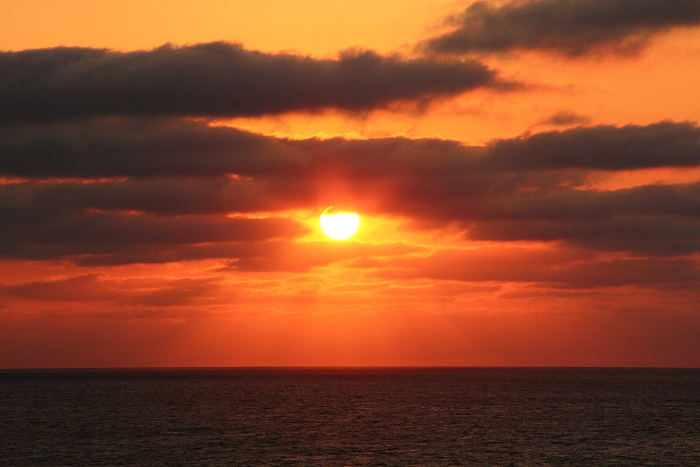 I actually took this while onboard the Carnival Spendor, which was anchored off Cabo San Lucas at the time. 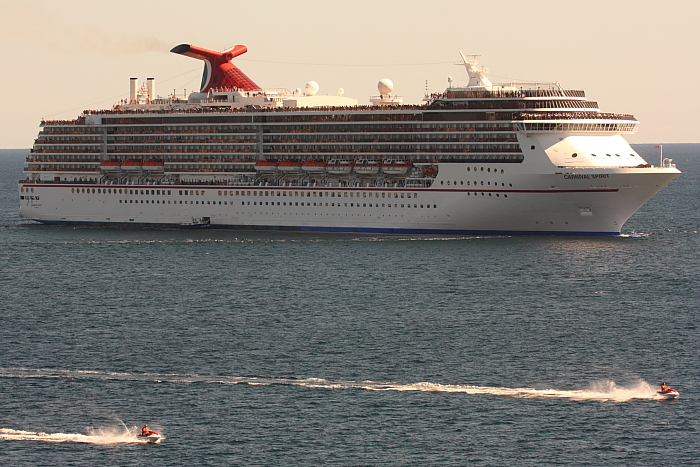 The Carnival Spirit had made an un-scheduled stop to do a medical evacuation of a passenger. waiting to transport the sick passenger to shore. If you look closely, you can see the decks are full of people trying to get a glimpse of the action. 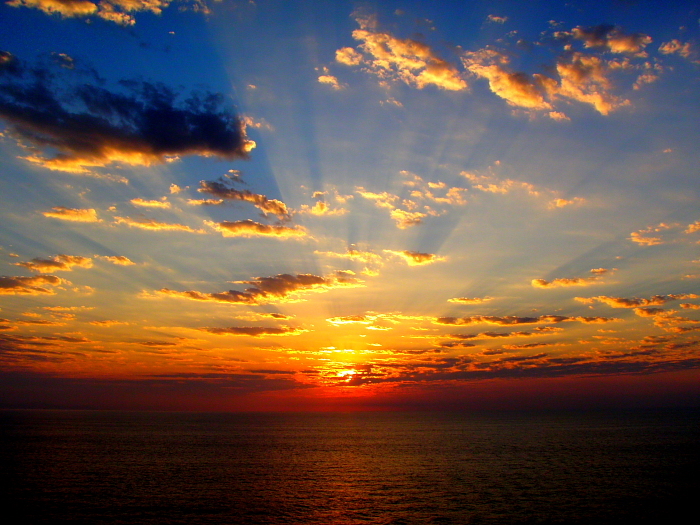 I'm an early riser, so I've seen quite a few spectacular sunrises from the deck of the Carnival Spirit! I use this picture as the desktop background image on my iPad. It looks great! go to this page and scroll down the page past the Cocker Spaniel pictures. 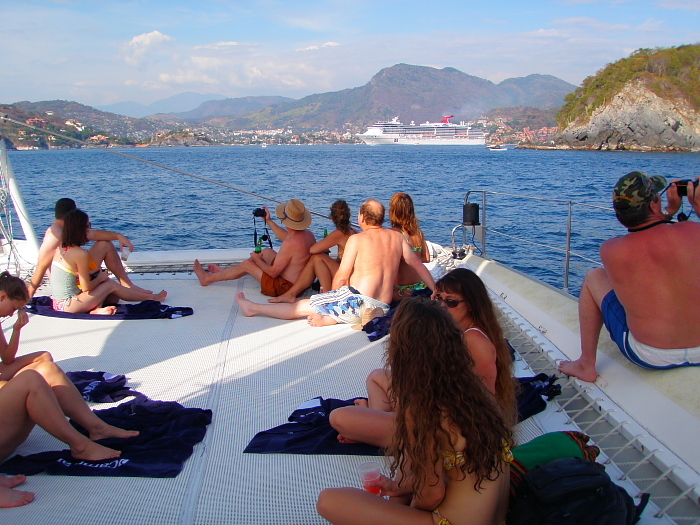 A really enjoyable shore excursion was a "beach break" in Acapulco. The ocean water temperature was 80 degrees. I bought an Olympus Stylus 1050SW, which is a waterproof digital camera. It worked extremely well, and allowed me to get many photos I never would have got without it! 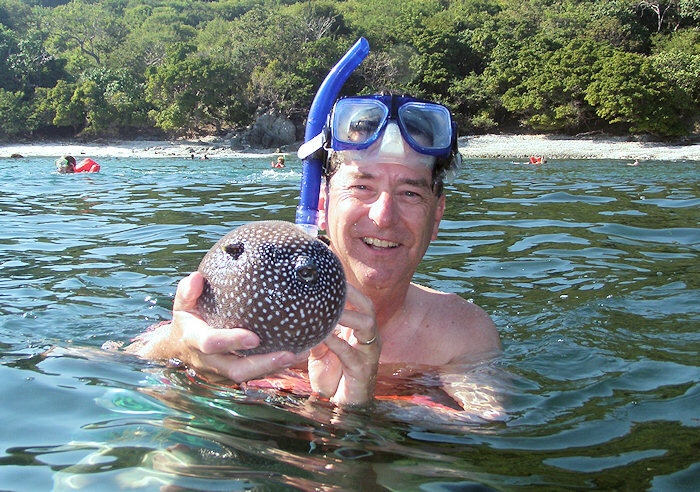 Another great shore excursion was snorkeling off the Picante catamaran. It was the most delightful afternoon, ever! Definitely my idea of paradise. 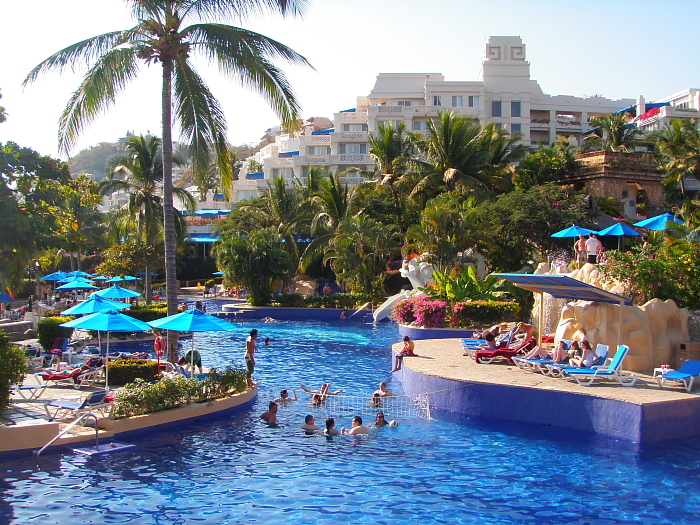 The shore excursion I was looking forward to the most was an afternoon at this resort in Manzanillo. I was a little disappointed with it, though, as even the ocean water was warmer than the water in this pool! as they served unlimited free drinks all day long. 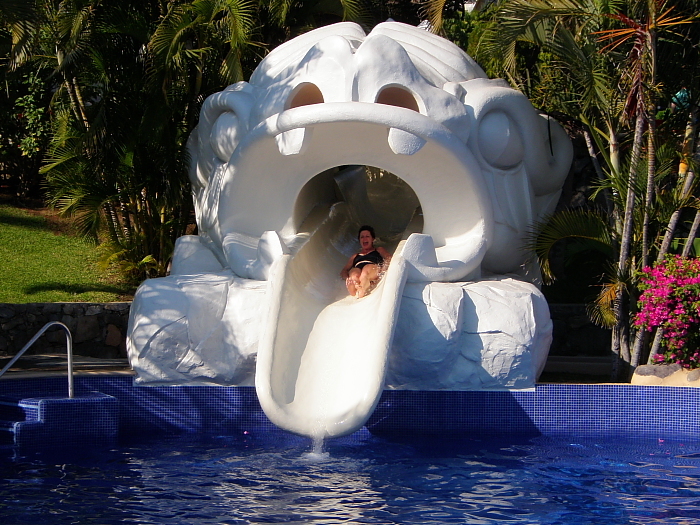 The resort in Manzanillo did have a very long and fast waterslide. However, the resort rules clearly stated that the waterslide should not be used by anyone over the age of 15, so I didn't try it myself. Here's my wife enjoying one of her favorite shore excursions, ever! 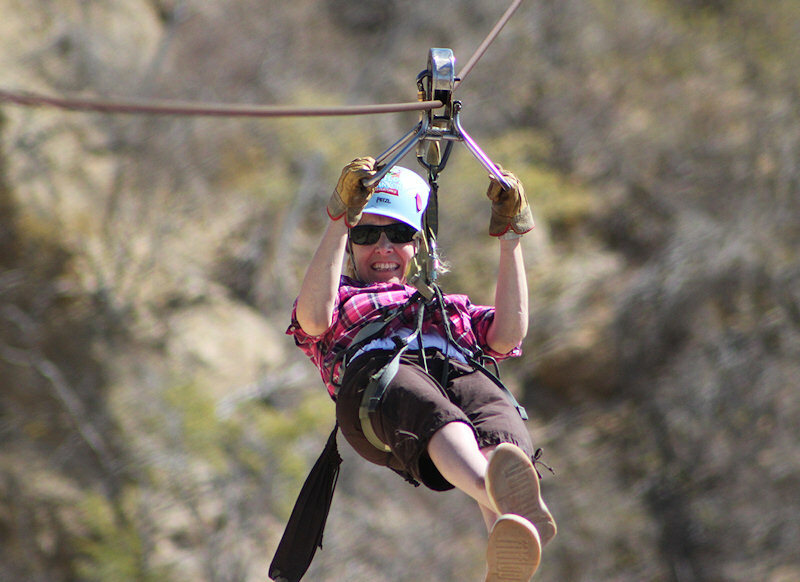 This is the zip line at Wild Canyon outside of Cabo San Lucas. We did this shore excursion in January of 2011. I would only recommend doing this in the cooler months of the year... definitely not in August or September! There is some hiking involved, to get from the end of one zipline to the beginning of another. It was 75 degrees the day we did it, and that was fine. On a 110 degree day, this would be miserable. 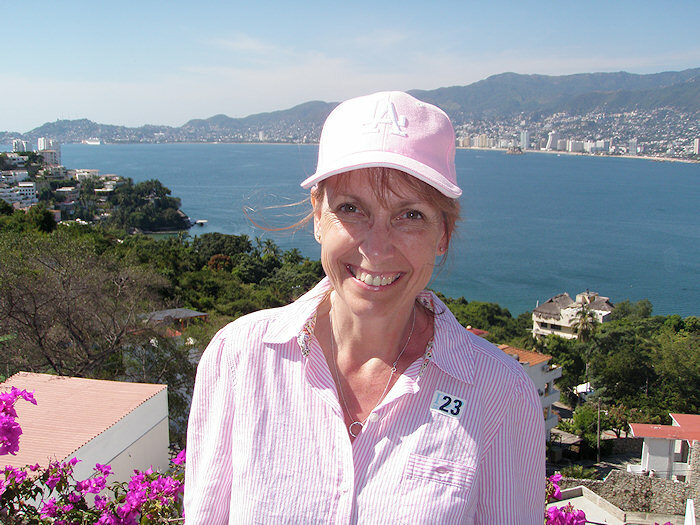 My wife poses for a picture overlooking Acapulco Bay during our 2010 cruise. Here's a look at about half of our cabin. I had the balcony door propped open with a bungie cord. 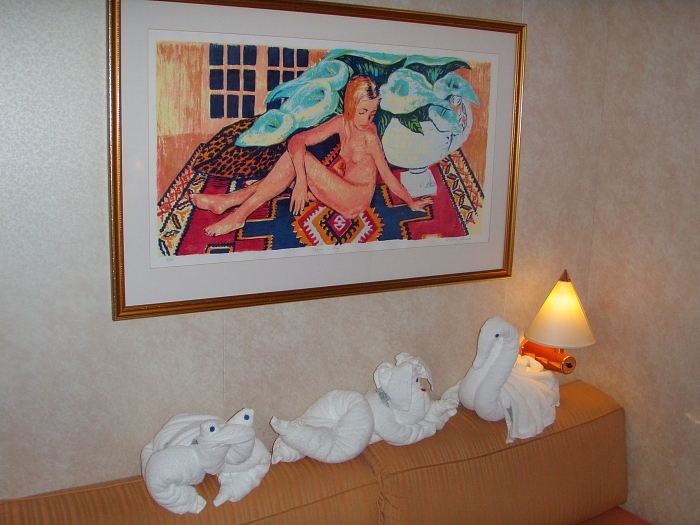 Note the towel animals on the bed. As we are dog breeders, the little doggie was our favorite! There is only ONE electrical outlet in your cabin, plus one very awkwardly-located one in your bathroom. If you are bringing several electrical devices with you (for example... digital camera, laptop computer, and cell phone) you should bring a six-outlet power strip so that you can plug more than one item in at a time. Just be aware that Carnival tightened their policy on power strips in 2010, and will confiscate yours if it is not in good condition or if you overload it. Bring a power strip that is in as-new condition, and don't try to charge all of your electronic devices at the exact same time. A bungie cord to prop open the balcony door. At least one 6-pack of your favorite beverage, so you don't have to pay ship prices for it. 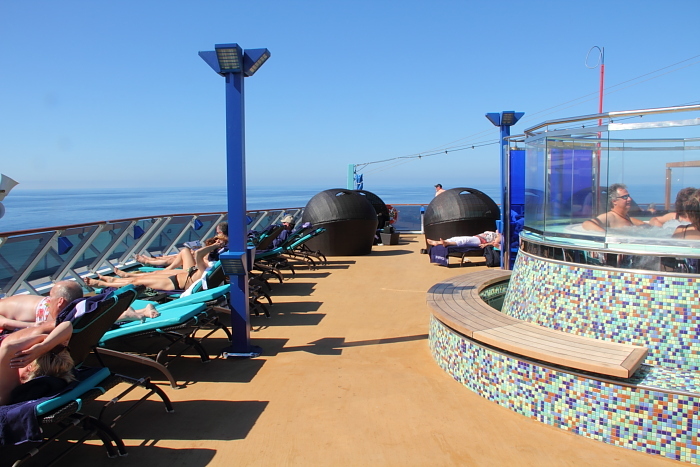 Your MP3 player, so you can listen to your favorite music while you relax in the sun on deck. One great thing about having a balcony cabin is that you can sit out there on the balcony and watch for wildlife in the water. 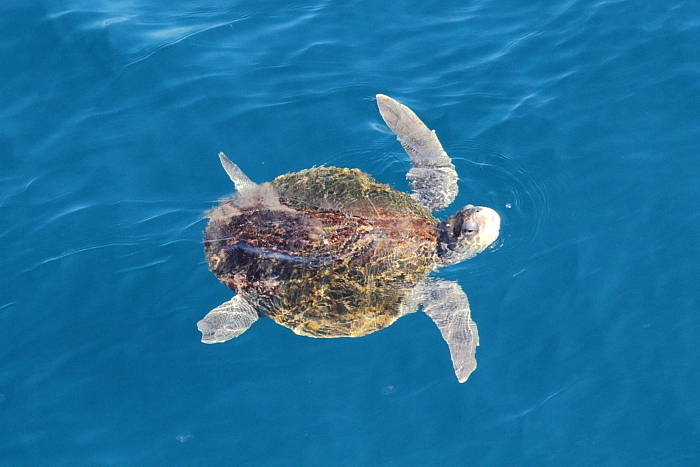 During our cruises to Acapulco, we've seen whales, dolphins, and turtles! I put my longest lens on to my Canon camera and snapped this photo of a turtle swimming by. This was a very tricky shot to get as the ship was moving at 20 knots and we were up way high above the water. A big zoom lens and a lot of luck are required! 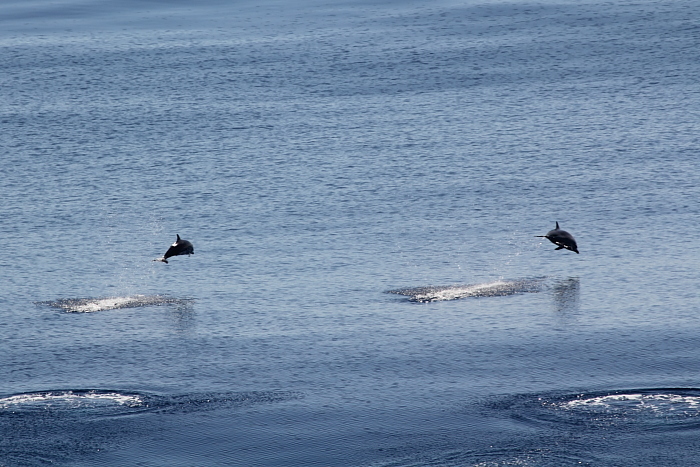 The coolest thing we saw on our 2010 cruise was a pod of dolphins swimming near the ship in Manzanillo Bay. as you can see from the rings in the water where other dolphins had splashed on the way in. During our 2009 cruise, we had an even more amazing dolphin sighting! A pod of dolphins swam over to the ship to frolic in the wake. and it can record video... so I managed to record a short video of the dolphins as they approached the ship. 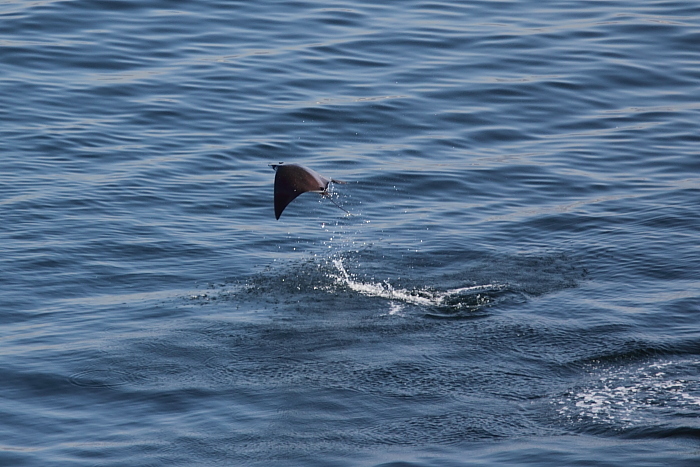 Another amazing thing we saw from our balcony as the ship was docked in Manzanillo was this sting ray. I didn't even know that sting rays liked to jump out of the water! My wife heard a loud splash as she was sitting on our balcony, and was surprised to see what was causing it. He jumped in and out of the water enough times that I had time to grab my camera and get this picture. 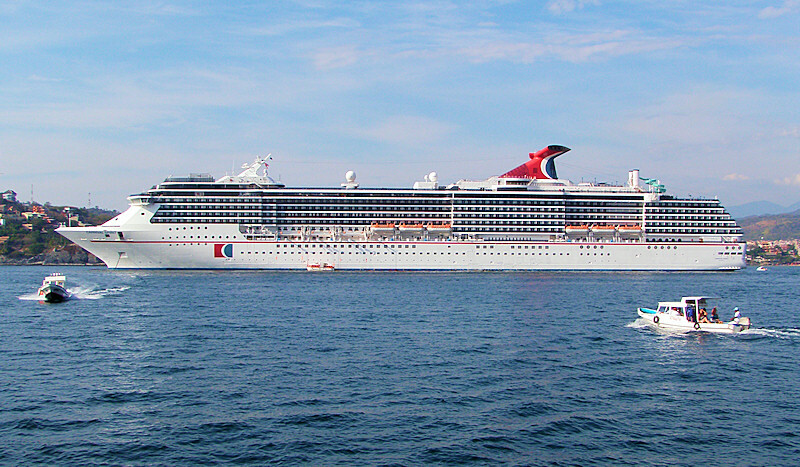 Before our cruise, I spent a lot of time surfing the Internet looking for photos of the Carnival Spirit. All the photos I saw of her big show lounge (Pharaoh's Palace) were taken when it was empty. So, I made a point to snap a few photos of the big showroom with people in the chairs! People waiting for a show to start in Pharaoh's Palace. During our 8-day cruise I enjoyed shows by two different comedians, plus a comic-magician and several Las Vegas style shows. Kirk Benning, the Cruise Director on our 2009 cruise. He was very good at his job! Here's another look at the Carnival Spirit, a very beautiful ship! People sunbathing on the sun deck during a "fun day at sea"
For those who have never cruised, this picture gives you a little idea of what life on a cruise ship is like. I was not personally offended by this piece of art in our cabin, but I bet some people would be. I think if you were travelling with children of a certain age, this might be a problem! and this exact same picture was on the cabin wall in two of three cabins we've stayed in! Another example of the same kind of thing, this one in a public area just outside the entrance to the dining room. As I said, this did not offend me personally, but I'm sure it would cause problems for some people. A still picture of this staircase does not do it justice. which collects in a small pond at the bottom. It's gorgeous. Tucked just behind "the fountain staircase" is a little karaoke lounge called Club Cool. most Karaoke singers just can not carry a tune. and that's a real joy to hear, and a very welcome surprise! My wife had foot surgery about two months prior to our 2009 cruise, and was limping around in an orthopedic boot. so that Kellyn would not have to stand around any more than necessary. With priority boarding, you are the first on to the ship. We really appreciated that the employee noticed the orthopedic boot and that she made things a little easier for us! 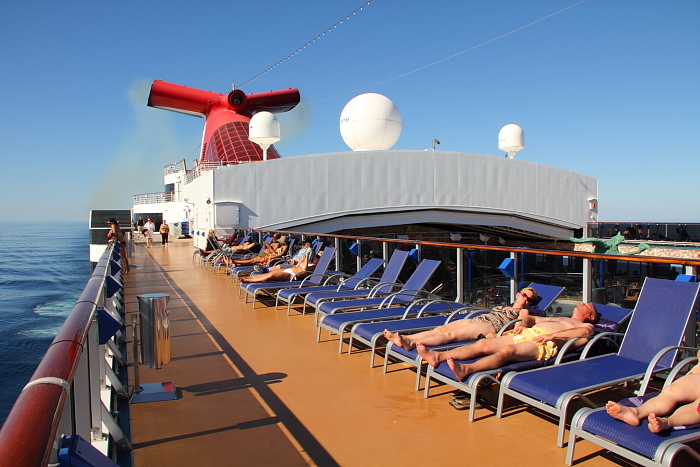 Another way to get priority boarding is to cruise with Carnival ten or more times. Starting with your 10th Carnival cruise, you are granted what is known as platinum status. 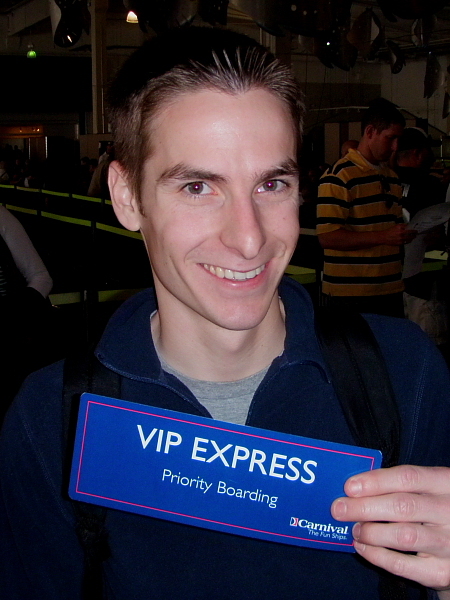 Priority boarding is one of several perks that Carnival gives to platinum level guests. you will see a picture of me with a very big smile on my face the day they gave me my platinum card! People dancing to a live band in the Versailles lounge during our 2009 cruise. The very unique decorations in the walls of the Versailles lounge. The Versailles lounge just also happens to have fantastic acoustics. It's absolutely perfect for live music. During our 2010 cruise, we got to experience "Superstar Live", something new that Carnival debuted that year. "Superstar Live" is like Karaoke with a live band. Watching it is something like being in the audience of an American Idol performance. My wife and I really like seeing live music performed... and we absolutely LOVED watching Superstar Live on the Carnival Spirit! This is Consuela, and she was the host of Superstar Live on the Carnival Spirit during our 2010 cruise. She is a fantastic singer, and we really enjoyed it when she would sing a few songs during the show. 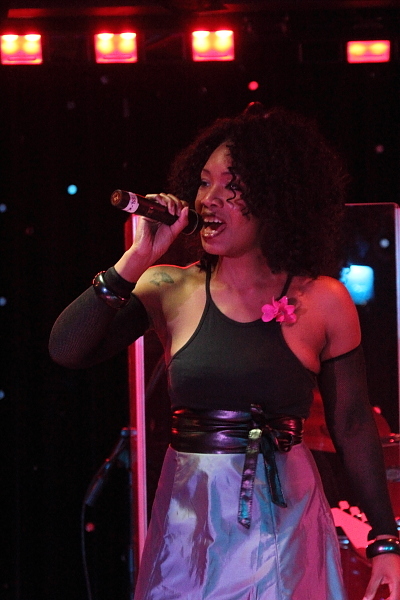 It totally delighted us when we discovered that she was still performing on the Carnival Spirit when we cruised again in 2011. Another thing you'll find in the Versailles Lounge is great comedy! 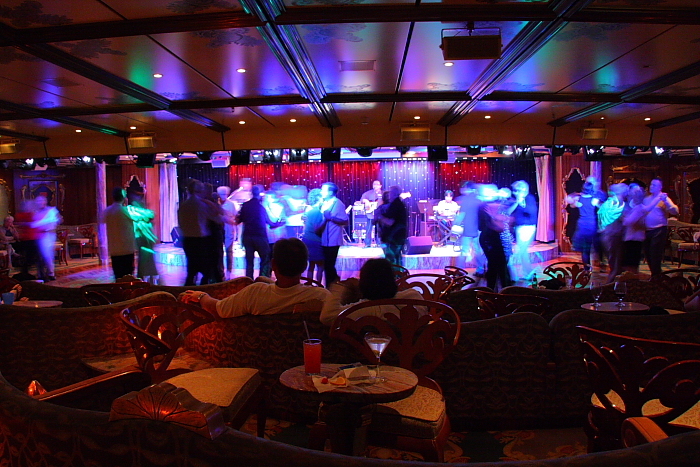 During several nights of the cruise, the Versailles Lounge becomes "the comedy club". 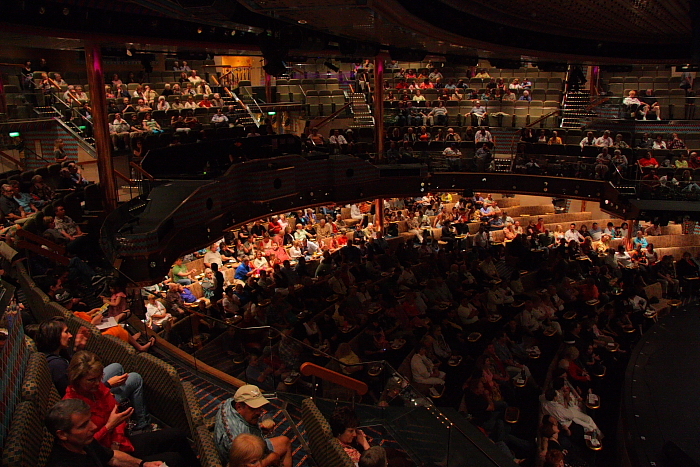 Carnival has found that guests enjoy the comedians so much, that they decided to offer a LOT more comedy on their ships in 2010. 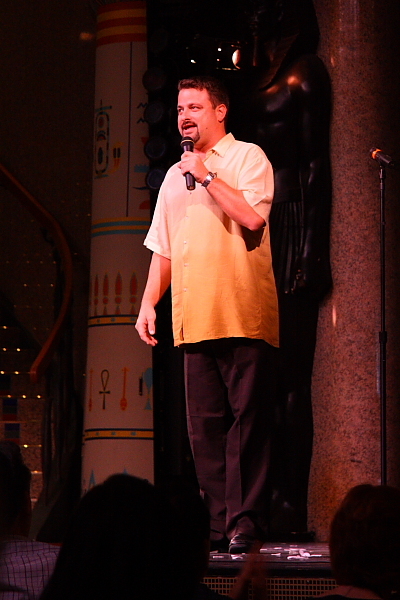 On most 5-day and longer Carnival cruises there are a total of four different comedians who perform on the ship! Early in the evening, they have comedy shows that are "PG" rated and appropriate for all but the youngest and most sensitive ears. Later in the evenings, they offer "R" rated shows that are only appropriate for those who are not easily offended. Another thing we noticed that was different on our 2010 cruise compared to the same cruise a year earlier was the pier facilities in Manzanillo. They built a new pier for cruise ships in Manazanillo, and it just opened in 2010. On our 2009 cruise, we docked in an industrial area of the harbor in Manzanillo... where the cargo ships dock. But in 2010 we docked at a brand new pier right next to a nice little shopping district downtown. You can just walk right off the ship and in to town now. It's a fantastic improvement. using a long exposure to give the water an unusual look. "Fashion Boulevard", with shops offering tax-free apparel, jewelry, liquor, etc. I had seen pictures of "The Jungle" in my pre-cruise research, but I really didn't know what it was! It's just basically a big long hallway leading to the arcade, but decorated in jungle style. It's a good place to get away for a quiet conversation with no one else around. I saw a Carnival officer use this place as a quiet spot to give a performance review to an employee. The aft of the ship is a popular place as it tends to be less windy. You are looking at the end of the waterslide, and one level below that is a small pool and jacuzzi. Way off in the distance, you can barely see another Carnival ship on the horizon! A photo I took from the deck of the ship, while we were docked in Acapulco. 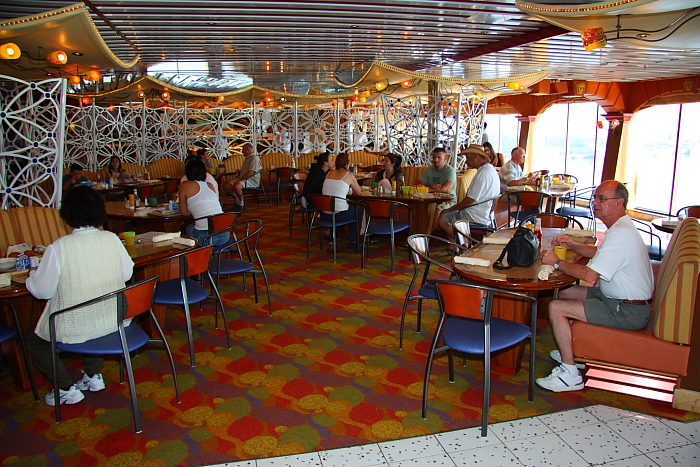 The casual dining area ("La Playa Grill") on the Lido deck. I enjoyed the food here! something along the lines of a bad mall food court. I liked the ambience of the Carnival Spirit's casual dining area better. It's casual, but not cheap or tacky looking. Speaking of dining... If you're familiar with the Carnival Spirit, you probably know that the main formal dining room is known as the Empire Restaurant. What you may not know, however, is that it's not pronounced like the Empire State Building. 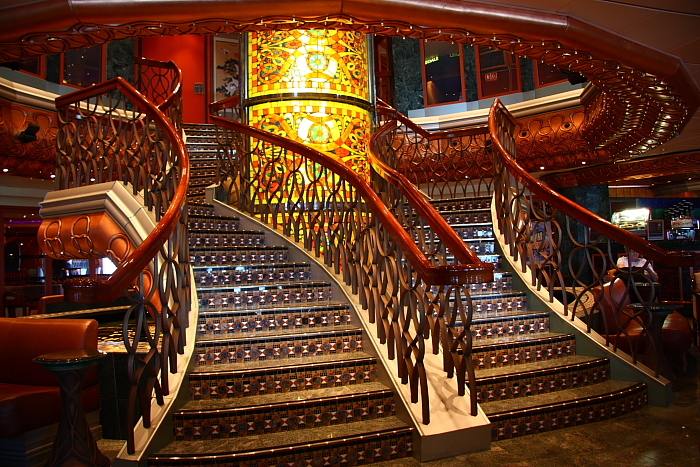 I saw an interview with Joe Farcus, the architect that designed the Carnival Spirit, and he explained that the dining room was named after a style of architecture called Empire... which is pronounced Om-PEER. It's a French word. That interview with Joe Farcus is really interesting, and it includes a pretty good tour of the ship. Follow the link and then select the video about the Carnival Spirit. If you're going to be cruising on the Carnival Spirit, I'd like to pass along a little tip that will really come in handy. One thing you quickly learn on a cruise ship is that there are a LOT of other passengers onboard... and the most popular places on the ship can get a bit crowded. So, let me tell you about a place that a lot of people never discover on the Carnival Spirit: the Jacuzzi located within the spa, at the far forward end of the Lido deck. While the Jacuzzis out on the open decks can get very crowded with people... the Jacuzzi within the spa gets very little use. My wife and I love this Jacuzzi, because we almost always have it all to ourselves and also because it's got a great view out the front of the ship. 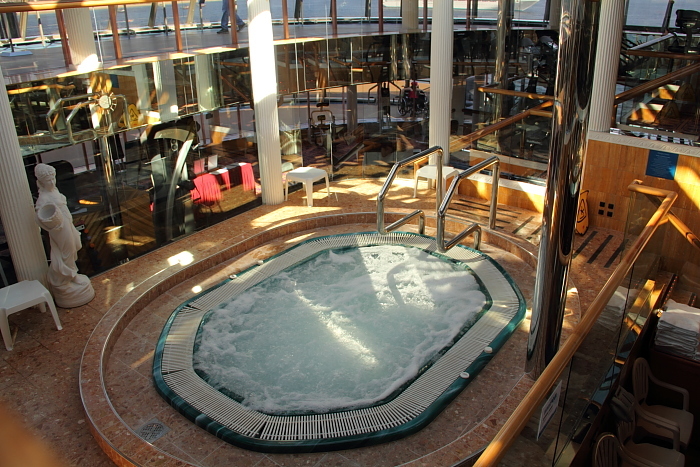 The Jacuzzi located within the spa facility on the Canival Spirit. Empty, as usual! And because this Jacuzzi is indoors, you don't get as cold when you step out of it. Also, you can't see it due to the angle of this photo... but there's a great view of the ocean from that Jacuzzi. People on a cruise are usually pretty lazy and only a small percentage ever explore the spa and the gymnasium on the ship... and that's why most passengers on the Carnival Spirit never discover this Jacuzzi. (It's located within the spa, and next to the gym.) Also, there may be a perception that you have to pay spa fees in order to use this Jacuzzi... because on some other Carnival ships (the Splendor, for example) there is an extra charge to use the Jacuzzi within the spa facilities. But on the Carnival Spirit... it's absolutely free, and open to all passengers. 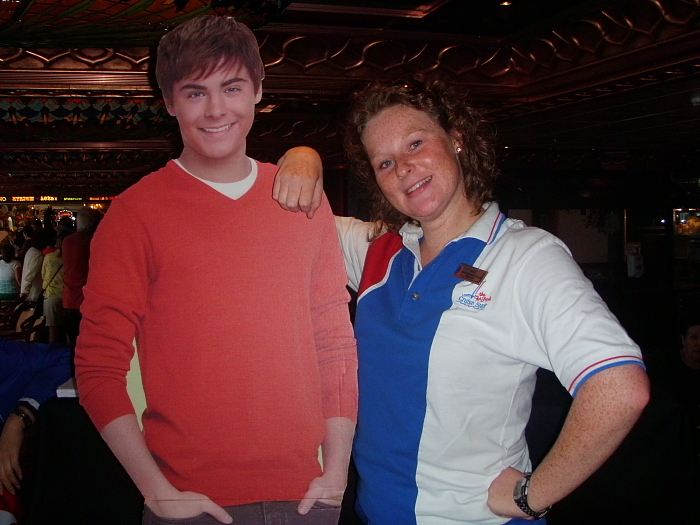 This is Katie Robinson, from the Carnival Spirit entertainment staff, with a cardboard cut-out of Zac Efron. I laughed when I saw her clowning around with this thing during our 2009 cruise, as I actually work with Zac's father and used to work with his mother. I snapped this photo and emailed it to Zac's dad, and he emailed back laughing that this kind of stuff still amazes him. He obviously knows his son is a big star... but when things like this happen, it just reminds him once again what a huge worldwide star his kid is. Absolutely do not email me asking me to pass a message on to Zac or his father, because you will be wasting your time! 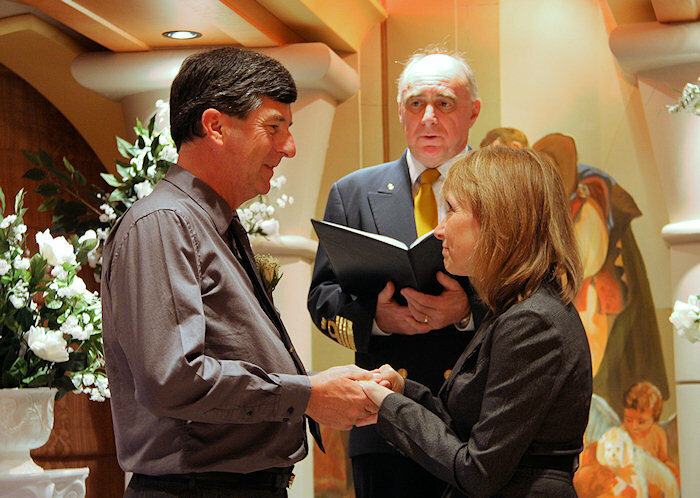 For you to truly appreciate the story of our 2010 cruise and the renewal-of-vows ceremony, I have to tell you what happened five months earlier. 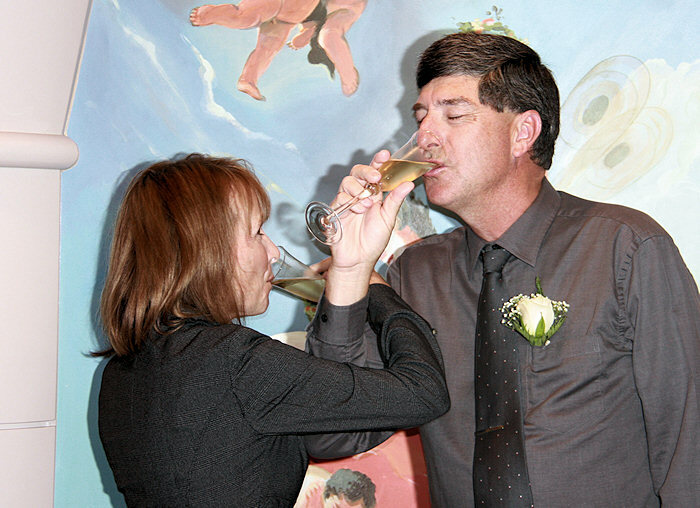 My wife and I had been married for 29 years and quite frankly, we hit a rough patch. Our relationship slowly deteriorated over the years, and in June of 2010 things came to a head... we filed for divorce... and my wife moved to Los Angeles and cut off almost all communication with me. We were separated for about four months before we finally started to realize that what we had was special and worth saving. I finally convinced my wife to talk to me in October, and all it took to "put Humpty Dumpty back together again" was one phone call... which started with a lot of anger and hurt feelings and ended an hour-and-a-half later with a decision to reconcile. And the November 2010 cruise, which I had originally planned as a way of having fun with 8 of my online friends and a way to forget about the ugliness of the divorce, became a second honeymoon... after one phone call to Carnival to add her on to the passenger list. I'm delighted to tell you that our marriage is now stronger than ever. 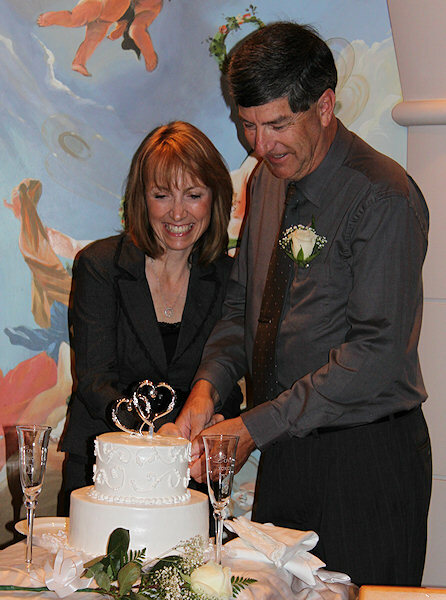 Nearly divorcing was a very strange way to strengthen our relationship, but it worked for us! 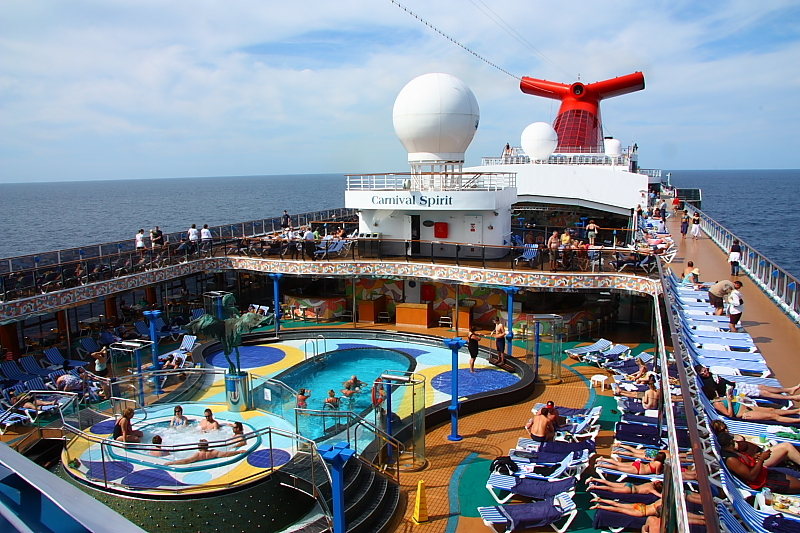 Summarizing our three cruises on the Carnival Spirit... we absolutely loved them! We've now been on four different classes of Carnival ships, and the Spirit class is definitely our favorite of the four. 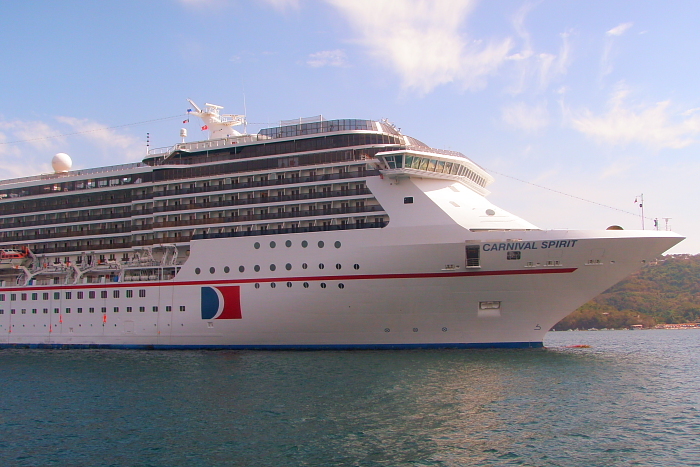 Carnival's Spirit class ships (Spirit, Pride, Legend, Miracle) are modern ships in very good condition and definitely an asset in Carnival's fleet. 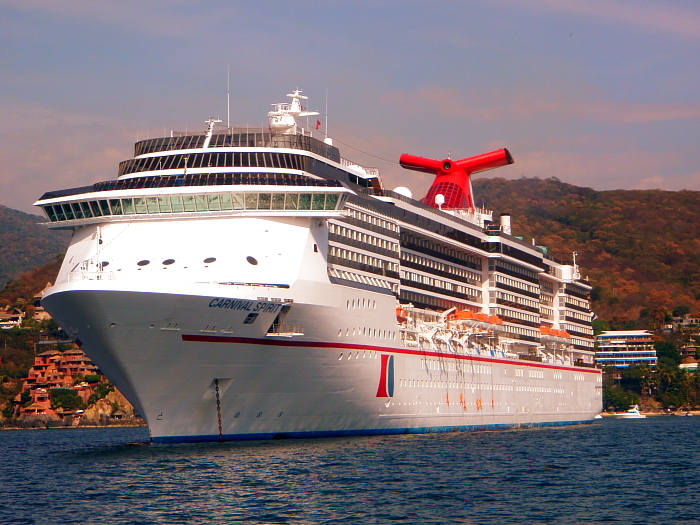 I like the Carnival Spirit better than the newer, larger Carnival Splendor because the Spirit carries about 1000 less passengers and therefore seems a lot less crowded. Imagine having 1000 fewer people to compete with for a place in line at the buffet lunch on embarkation day... or for a place around the pool at an at-sea day. The food. I'm a picky eater, and food has been a problem for me on two of our previous cruises. No problem at all on the Carnival Spirit. Loved it! The staff. We were treated well at all times, by every employee. It seemed like a happy group of people that liked their jobs. We were impressed with their attitudes! All of us noticed this. Our cabin steward and dining room server were especially nice to us. Our cabin steward knew our names and used them each and every time he greeted us... and I mean even if it was a surprise meeting in the hallway. It's one thing to look up someone's name before you know you are about to enter their room... quite another to be able to come up with it off the top of your head when running in to them unexpectedly. And not only did he genuinely know our names, he actually pronounced my wife's name correctly each and every time... which rarely happens to us! The interior decor. Some Carnival ships have an interior design that is a bit loud and in your face... like the loud pink circles inside the Carnival Splendor. 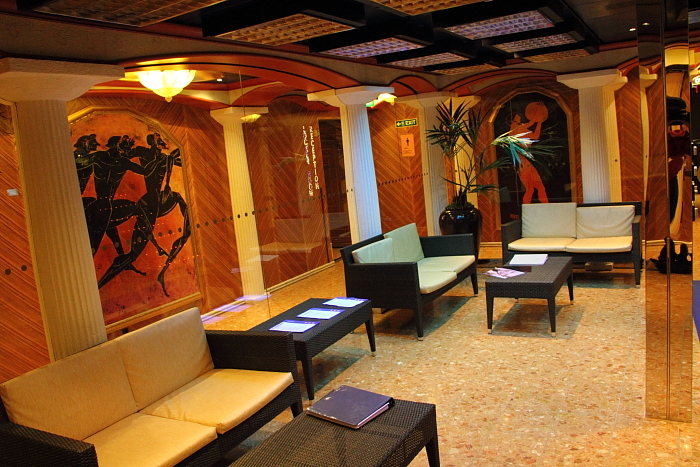 The decor of the Carnival Spirit is more elegant and subdued. Sure, there are "fun" elements to the design... but overall it really never screams at you like it does on some of the other Carnival ships. The "Picante Sail & Snorkel" shore excursion in Zihuatanejo. We loved it, and it was exactly like the fantasy I had in my head prior to the cruise. Warm weather, warm ocean water, a smooth catamaran ride surrounded by beautiful young people in swimsuits... and the highlight was a wonderful snorkeling experience with plenty of ocean life to see. All this and unlimited free drinks, too. My vision of heaven looks a lot like this! The "Acapulco Beach Break" shore excursion. 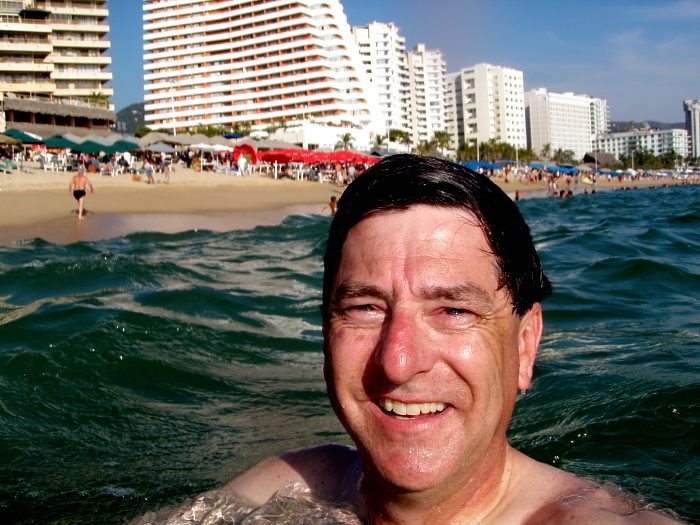 I absolutely loved swimming in the warm water of Acapulco Bay and playing in the surf. They also served a great buffet lunch... and the drinks were unlimited, free, and brought right to your chair in the sand. However, the constant parade of local people stopping by to try to sell you jewelry, sunglasses, tattoos, and souvenirs was REALLY annoying! But it was a public beach, so I don't think there's any legal way to stop that. The overall experience in the Empire dining room. During our 2009 cruise, it was three of us travelling together... and we had a private table for three in the dining room. Perfect! Also, the food was good and our server was fantastic. And unlike a few meals we had in the specialty restaurants on the Norwegian Star, there was actually enough separation between tables that we could have a private conversation. Actual Mexican food! 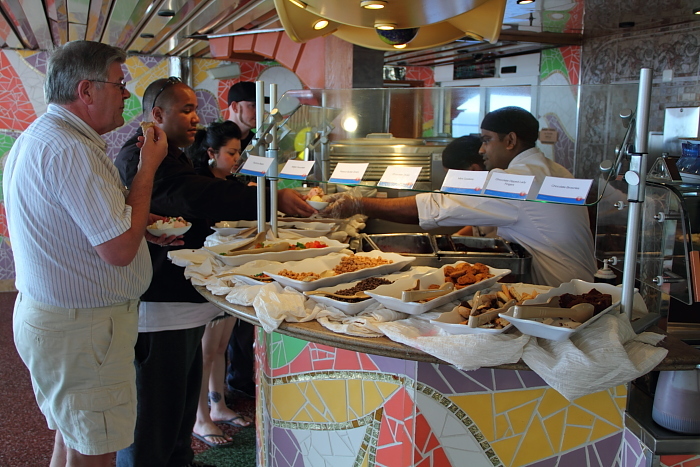 On our three previous cruises to the Mexican Riviera, it became a running joke about how little Mexican food was served. There was a lot more Mexican food on the Carnival Spirit. Thank you, Carnival! What I really think they need to do when they cruise to Mexico, however, is to eliminate the Asian station in the casual dining room and convert it to Mexican... so that there are Mexican entrees available at every meal, every day. Embarkation/debarkation. During our 2009 cruise, a Carnival employee noticed that my wife was limping and wearing an orthopedic boot. All three of us were given priority boarding passes, which allowed us to breeze on and off of the ship. Thank you again, Carnival! Lunch in Zihuatanejo. We were roaming around the little village at lunch time and walked past a small hole-in-the-wall restaurant. An employee was out front, trying to entice people in to the restaurant. He asked me if I was hungry, and I gave an honest answer of "yes". Next thing I knew, I had a menu in my hand... and not too long after that I had a fantastic plate of steak fajitas in front of me. Lunch for two, including a diet Coke and a very large Margarita, came to $19... and it was worth a lot more than that! The background music that plays in public areas such as the lobby and the dining rooms. During my 2008 cruise on the Norwegian Star, I was constantly amazed at the strange mix of unknown international music that was playing in the background. On the Carnival Spirit, a very large percentage of the songs were soft pop hits from the 70s and 80s... very recognizable to the 40/50/60 year-old American folks on board. Sure, as a former radio station program director, I would tighten up the ol' playlist a bit further (ask yourself if you think the average 50 year-old American would want to listen to that song while eating breakfast) but overall I think Carnival has a lot better idea of the kind of music their average customer likes than Norwegian Cruise Line does! "Superstar Live". 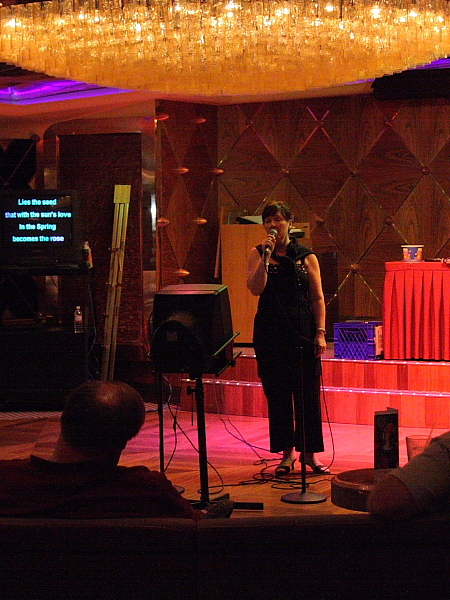 This new feature that Carnival added fleetwide in 2010 is a fantastic improvement to the traditional cruise ship karaoke experience. Singing karaoke along with a CD player can be a little boring. Singing karaoke with a live band behind you is a much bigger deal! It's really fun to watch. The opportunity to be casual at all times, if we wanted to. 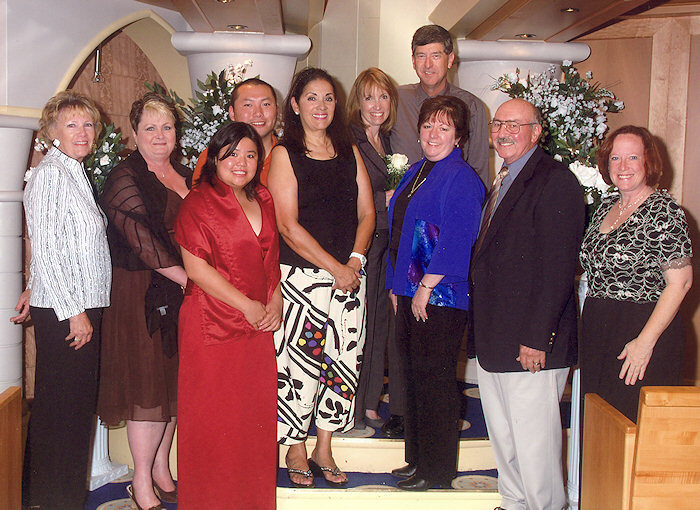 On our 1996 Carnival cruise, there was no alternative to the formal dinner on "formal night". This time around, there were two formal nights. We dressed up for the first one, but when the second one rolled around we wore jeans and ate in the casual restaurant instead. We're just not formal, so we really appreciated not having to be! Our cabin. Loved the balcony! Nice bathroom, too. Consistent with what we had seen on the Elation a year previously, the bathroom had a really nice layout, and a fantastic shower. Also, there was plenty of storage in our cabin. We completely unpacked four suitcases in to the various drawers and closets in our cabin, and then tucked the suitcases away... under the bed. The "fun" factor onboard the ship. We had a lot of fun! Laughed ourselves silly at the comedy show and several of the game shows! Based on our previous cruises, this was what we expected, and the entertainment staff did indeed deliver it again this time. Soft serve ice cream and frozen yogurt. Carnival is famous for this! It's free, and available 24/7. Just serve yourself any time you have an ice cream craving. And if you get a hankering for a "real" scoop of ice cream rather than soft serve, it's available in the Empire restaurant after your meal. The best move Carnival could ever make to increase customer satisfaction would be to place soft drink dispensers in the casual dining room so that Coke, 7UP, Dr. Pepper, etc. would be as free and accessible as the soft-serve ice cream is! Internet access. When you think about the technology involved, it's absolutely amazing that you can get Internet access while cruising on the Pacific ocean. And you don't even have to go to the Internet Cafe to take advantage of it... if you bring your laptop computer, iPad, or smartphone with you, just use the shipwide wireless Internet connection and you can use your electronic device in your cabin, on your balcony, or wherever you go on the ship. The past-guest party. Several days in to the cruise, we got an invitation to a special party thrown exclusively for people who had sailed with Carnival before. It was a nice party, and they had drink servers bringing free drinks around to all the guests... and not just one free drink at the beginning of the party, but they kept bringing more and more. I could have had three or four free drinks at that party if I had wanted to! Cell phone access. 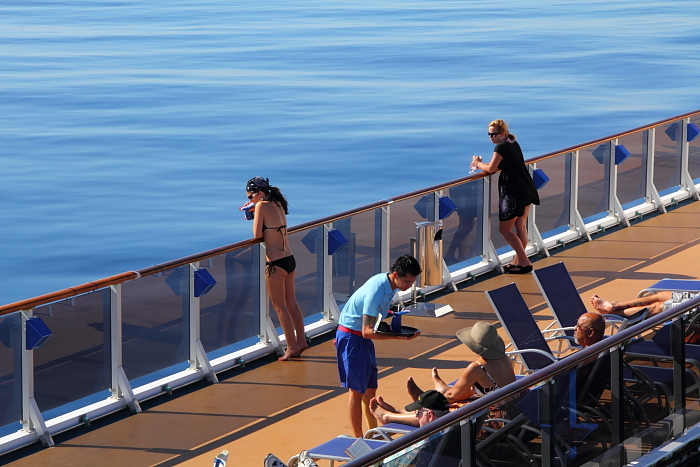 Yes, your cell phone will work on the ship, even when you're at sea. We did a lot of text messaging to our son, to coordinate our schedules onboard the ship. It didn't turn out to be outrageously expensive. Drink prices. 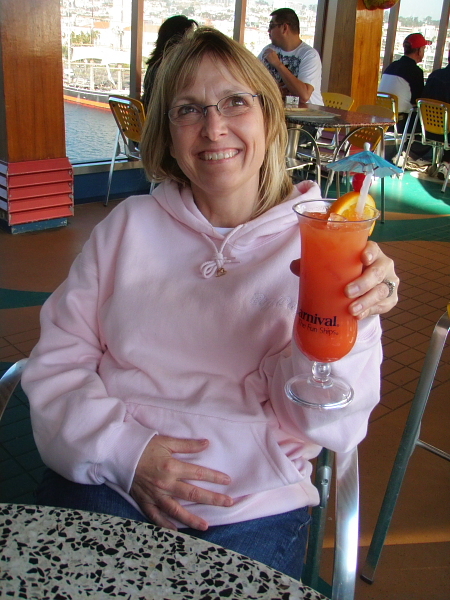 I'm not a big drinker, so I rarely order a drink on a cruise ship. On our first day, I wanted to loosen my wife up a bit by buying her a little umbrella drink as we sat around the pool. I was shocked when I discovered it set me back well over $12. That was the last drink I bought on the cruise! The layout of La Playa Grill, the casual dining venue. There are eight food stations, scattered over a wide area. (Six inside, plus two outside by the pool.) It probably sounded like a great idea when they designed it, but the reality of the situation is that you end up having to walk around to eight widely scattered locations before you know what all your choices are. A more ideal arrangement would be to put all the various serving stations closer together, while still allowing enough room for dozens of people to serve themselves at the same time. Of course, they're not going to completely re-design and re-build the Carnival Spirit anytime soon... so my suggested "workaround" solution would be to post a complete list of what's being served at each entrance to the restaurant, along with information about which food station you can find the item at. For example, the sign would say roast beef is at station #1, chow mien chicken is at station #2, hamburgers are at station #3, chicken noodle soup is at stations #1 and #3, and rice is at stations #1, #2, and #3. A persistent unpleasant odor in the bathroom on our 2009 cruise. I think the ventilation system was sending fresh air in, but not exhausting any dirty air out. Have you ever been in to a public bathroom where they have those things mounted on the wall that spray a deodorizer in to the air at certain regular intervals? They need to install something like that in each bathroom on the ship, in my opinion! We didn't have a problem with this on our 2010 cruise, though. Pizza! I really like pizza and I eat a lot of it at home. The pizza in the cafeteria at my job is actually better than what Carnival serves, in my opinion. I'm not exactly sure what it is about the Carnival pizza that's not right... but I definitely think there is a lot of room for improvement! 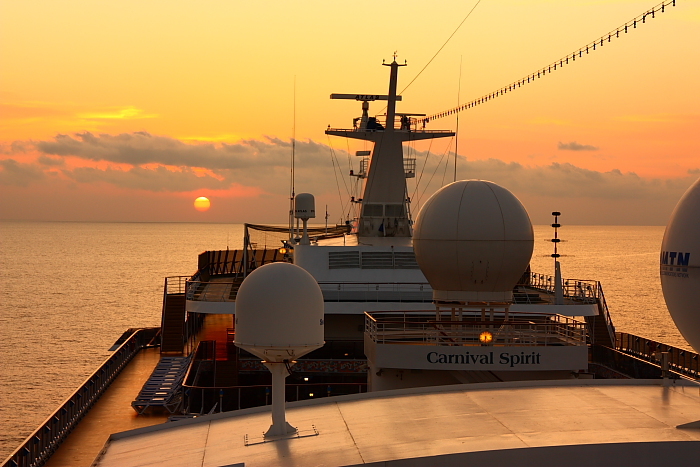 In addition to all the still pictures I shot on our cruise onboard the Carnival Spirit, I also shot some video. I've edited the video down to a five-minute highlight package, which gives you a pretty good look at life aboard a cruise ship. Click here to watch my Carnival Spirit video! Significantly better food on the Carnival Spirit. There wasn't a single meal on the Norwegian Star where I found myself saying "wow, that was a perfect meal!" It happened quite a few times on the Carnival Spirit. But it really wasn't the big things that made the difference... in an amazing number of ways, NCL failed to do the little things that make the difference between a cafeteria-quality meal and a restaurant-quality meal. For example, in the Empire Dining Room on the Carnival Spirit when you are served a dinner roll it is a warm dinner roll and it is served with softened butter. On the Norwegian Star the roll is stone cold, and not only is the butter not softened but it is actually chilled... which makes it impossible to spread on the roll. Another example is a meal we had in the exclusive supper club on the Norwegian Star. I ordered a steak, and it turned out to be a very nice steak indeed, and quite large. But it was served with a baked potato that was not much bigger than an egg. Big steak, tiny potato... not something I have ever experienced at any of the steakhouses I've ever gone to. In fact, tiny serving sizes were somewhat of a recurring theme on the Norwegian Star. I ordered an omelet and hash browns for breakfast one morning and I am not exaggerating when I say the serving size of the hash browns was less than two inches square. OK, I can roll with the punches... so the next morning I ordered the exact same thing only this time I'm older and wiser so I asked the waiter to please bring me THREE servings of hash browns. My breakfast arrived and I again got a nice omelet accompanied by a single serving of hash browns less than two inches square. Contrast that to the Carnival Spirit where the first night in the dining room I explained to our waiter that I really like potatoes so when he brings my steak could he please bring two servings of potatoes? No problem. Two servings arrived with my meal... and, in fact, every night for the rest of the cruise I was served two orders of potatoes without having to ask. More fun on the fun ship! They really do call them the fun ships for a reason! We had trouble coming up with fun things to do to fill the time on our NCL cruise. On the Carnival Spirit (and the two other Carnival cruises we've been on) there are fun things to do all day long... from trivia contests, to the newlywed/not-so-newlywed game, to bingo, to the hairy chest contest out at the pool. Sure, NCL had some of those things, but they seemed to be less frequent than what you find on Carnival. Practice makes perfect. On a Carnival cruise, you get the sense that they worked the bugs out of the system a long time ago. Things just work. 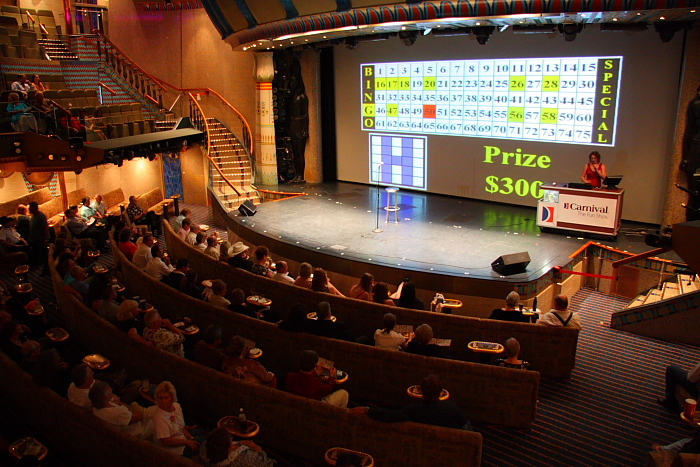 On the Norwegian Star, it sometimes seemed like an inaugural cruise where they hadn't quite perfected their system yet. For example, on the first afternoon of the cruise they made an announcement over the PA system that the cabins were all ready for the guests. Great! So, we headed to our cabin and tried to open the door with our room key/card. It wouldn't open. OK, nothing to get upset about. It was probably just some random fluke of some kind and we were just the one unlucky couple it happened to, right? No. When we we went down to the purser's desk to straighten it out, we found a long line of guests who were waiting to resolve the exact same problem. Wow, you would think after doing the same cruise every week, week after week, that eventually they would at least figure out how to properly encode a room key/card! Larger bathroom. In our cabin on the Norwegian Star, the bathroom was physically divided in to three separate areas: a sink area, a shower area, and a toilet area. When you divide a small room in to three parts, you make each part REALLY small! I weigh in at about 200 pounds and when I sat on the toilet it was a pretty tight fit for me. Anyone in the "significantly overweight" category would have had a real tough time using that toilet! In fact, after 8-days of thinking about this fact, I finally mentioned it to another cruiser and he laughed and said that he had to assume that some of the people on the ship (in the 300+ pound category) probably had to go to a public bathroom on the ship rather than use the toilet in their cabin bathroom! No such problem on Carnival... with what are widely acknowledged to be some of the largest cabins (and bathrooms) on the seven seas. Unlimited free soft-serve ice cream and frozen yogurt 24/7. The Norwegian Star does serve real ice cream from a special window, but only a few hours a day. While I did like the Norwegian Star's real ice cream (scooped by a real person, and served in a cone) better than Carnival's soft-serve ice cream, things tilt in to Carnival's favor since NCL only serves it a few hours a day and they only give you one scoop of ice cream on the cone. Carnival's soft-serve ice cream and frozen yogurt is "good enough" and the fact that you can have as much as you want whenever you want makes it better overall, in my opinion! Plus, in 2010 Carnival added a new feature to the Spirit... an ice cream bar at the far aft of the ship... where real ice cream is served for several hours in the afternoon. You can even get things like a banana split or build your own ice cream sundae. Each day of the cruise, they publish a little newsletter that tells you information about what will be happening on the ship that day. It's called "Fun Times". (Formerly known as "Carnival Capers".) If you've never cruised before, you'll find looking at a copy of the Fun Times to be a great way to see the kinds of activities available onboard the ship. I've scanned the Fun Times from each day of my 2010 cruise. All are in .pdf format. Replace the safes that are in the cabins. Using a credit card to open a safe... that's a REALLY dumb system! Credit cards are one of the things the passengers want to lock up inside the safe! 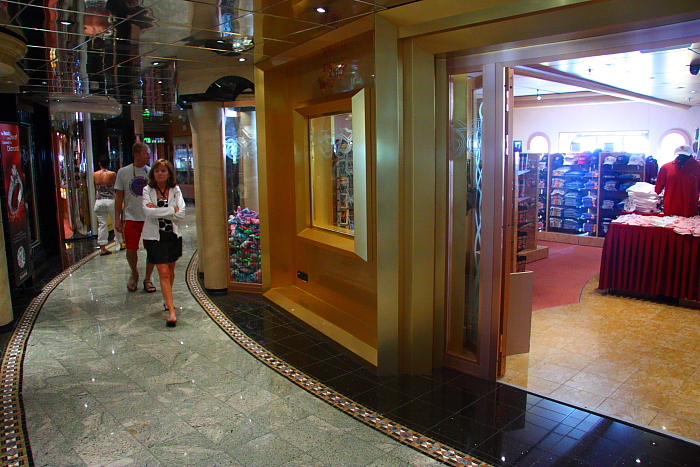 Go see how the safes work in the cabins on the Norwegian Star. That's a much better system. Each person just punches in a unique combination of numbers at the beginning of the cruise... and that's the combination that will open the safe. It's simple and convenient. Either add more power outlets in the cabins or revoke the ban on passenger use of power strips. What's so dangerous about using a six-outlet power strip that has prompted you to confiscate them when you find one? In this day and age, it's not unusual for people to need to charge a cell phone, laptop computer, and digital camera overnight. When the ship is cruising to Mexico, ditch the Asian section of the La Playa Grill and make it a Mexican buffet instead. It's a cruise to MEXICO. It makes no sense to have Asian food more readily available than Mexican food! The way you offer free soft-serve ice cream 24/7 is brilliant. Now you need to do the same thing for soft drinks such as Coke, Sprite, Dr. Pepper, etc. Self-serve soda dispensers are commonplace in the food industry. Put them on your ships! Something stinks in the bathrooms in the cabins. Install some automatic deodorizer dispensers. Post a menu at each of the entrances to La Playa Grill. The menu should indicate what entrees and side dishes are available, and what food serving station to go to if you want that item. With six food serving stations within La Playa Grill and two more out by the pool, it's just too awkward to visit each station first to see what's available before finally putting something on your tray. If you're a fan of the Carnival Spirit, here's something you should buy! 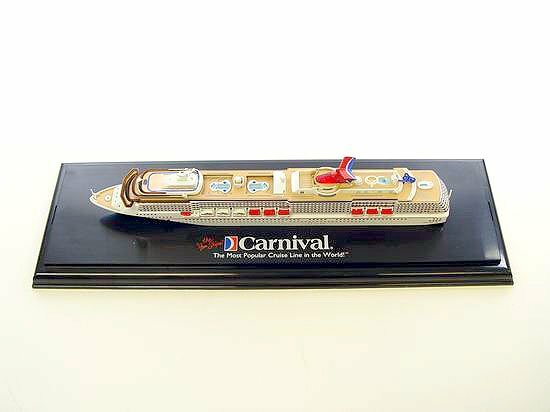 It's a 1:1250 scale model replica of the Carnival Spirit! Click here to buy one or to simply get more information about it.